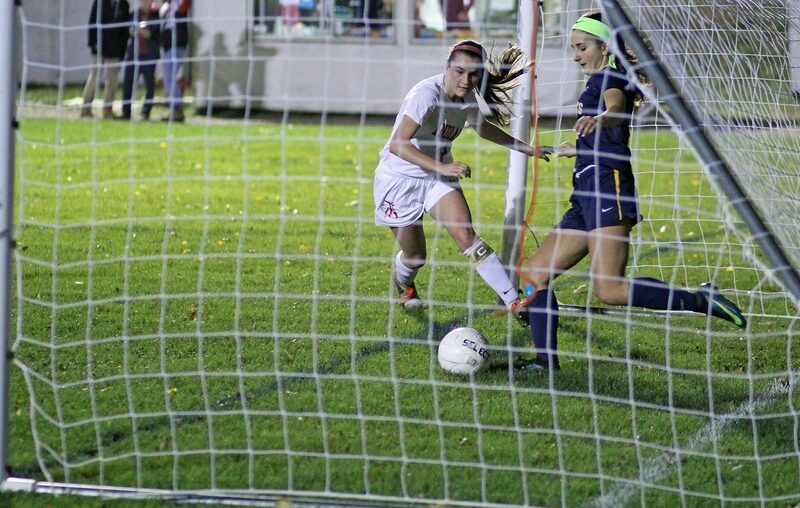 Michaela Halloran’s tap heads for the goal line as a lunging Morgan Mackie tries to stop it. 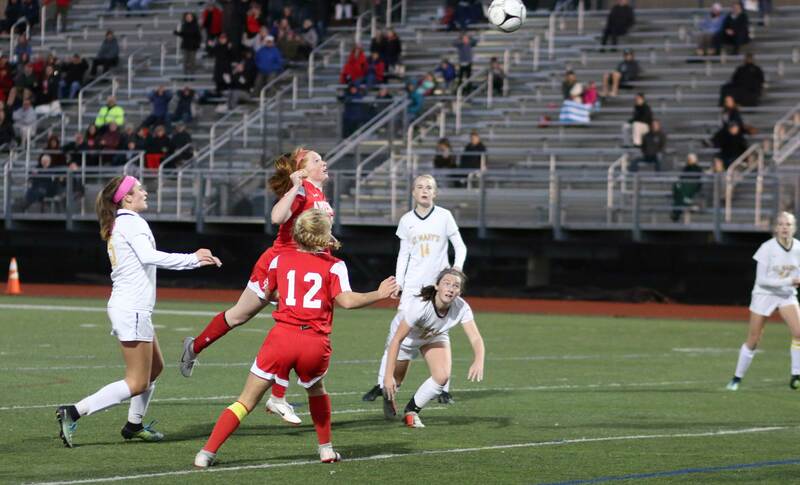 (Amesbury MA) The scoreboard at Landry Stadium wasn’t up to speed but the Amesbury girls’ soccer team sure was as they defeated St. Mary’s, 2-0, in the Division 4 North quarterfinals. 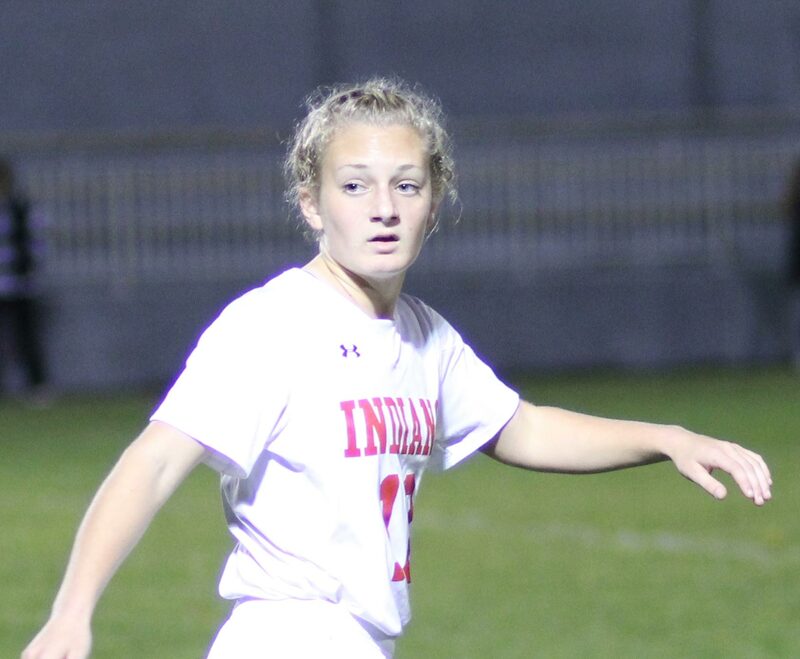 The Sunday evening matchup featured a heavy dose of pressure by the Indians on the Spartans. 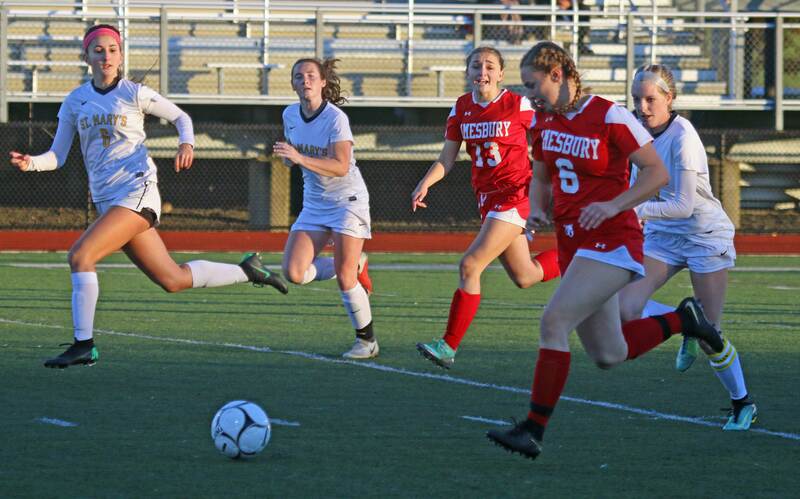 There were plenty of passes away from the middle that gave Amesbury’s speedsters opportunities to create scoring chances. 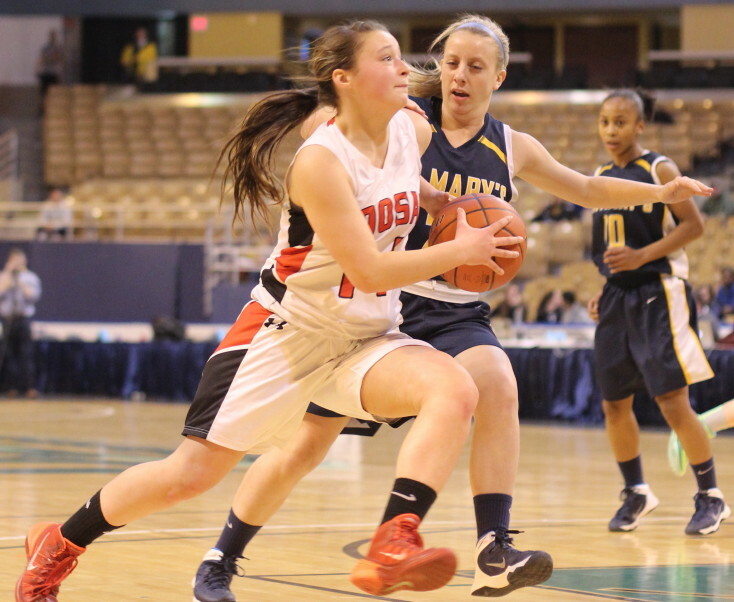 “When we play fast, we play our game,” said Amesbury coach Adam Thibodeau afterwards. 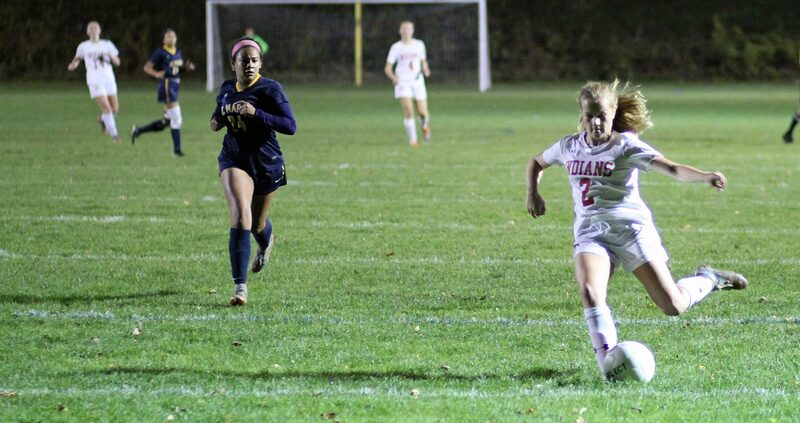 The Indians (14-5-1) scored both of their goals (Hannaih Burdick, Michaela Halloran) in the first half. 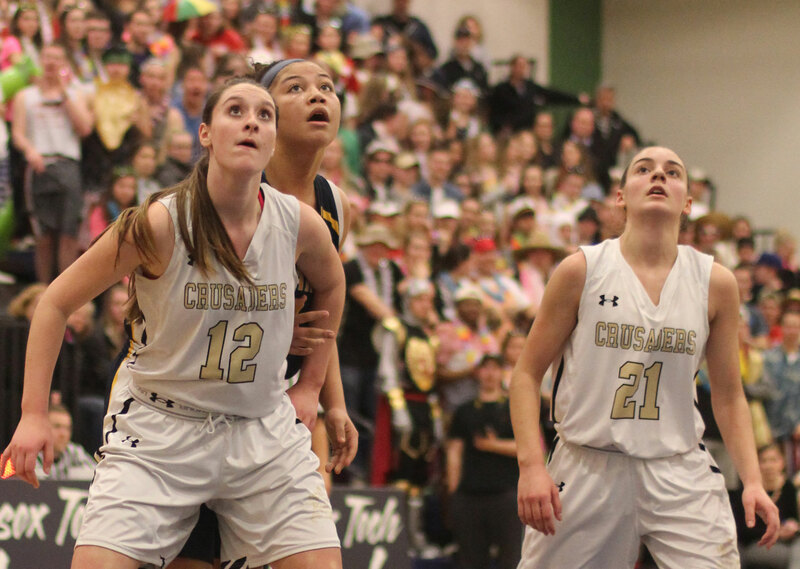 Instead of playing conservatively in the second half, Amesbury just kept attacking. And there was only one reason why this didn’t end up being a seven or eight goal game: Alex Iacoviello. 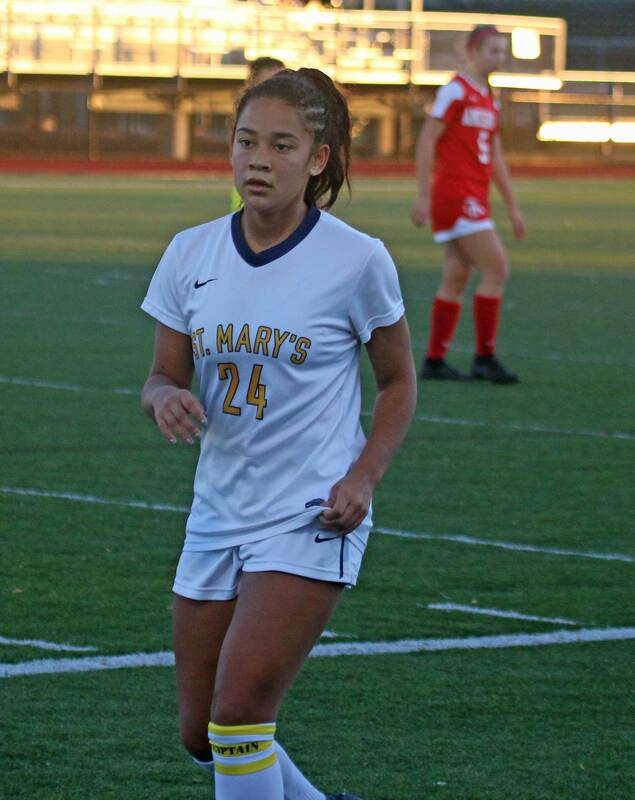 The St. Mary’s goalie faced shots from just about everywhere in the second half and dazzled everyone with the saves she came up with. 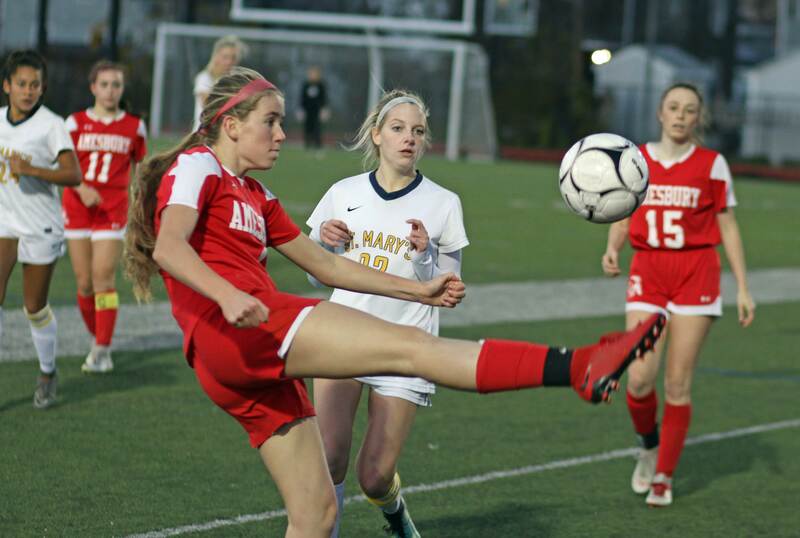 “Their goalie was absolutely spectacular,” said AHS coach Adam Thibodeau. 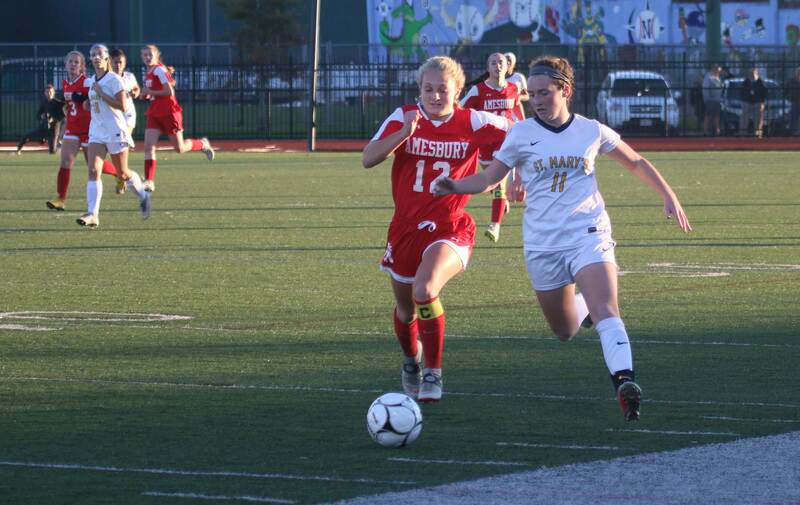 By keeping the heat on the St. Mary’s defense, Amesbury was able to limit the chances the Spartans had. But the team from Lynn did have several anyhow. 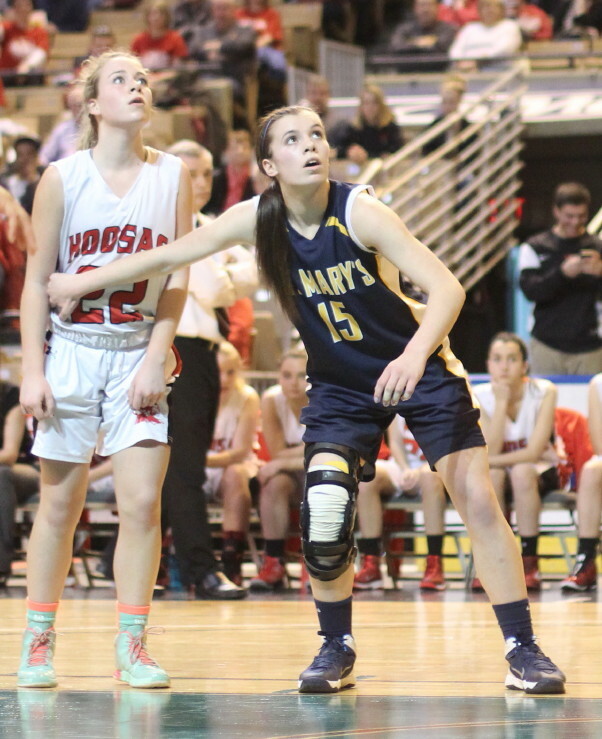 St. Mary’s top scorer (Kayla Demers) had a good look in the second half. 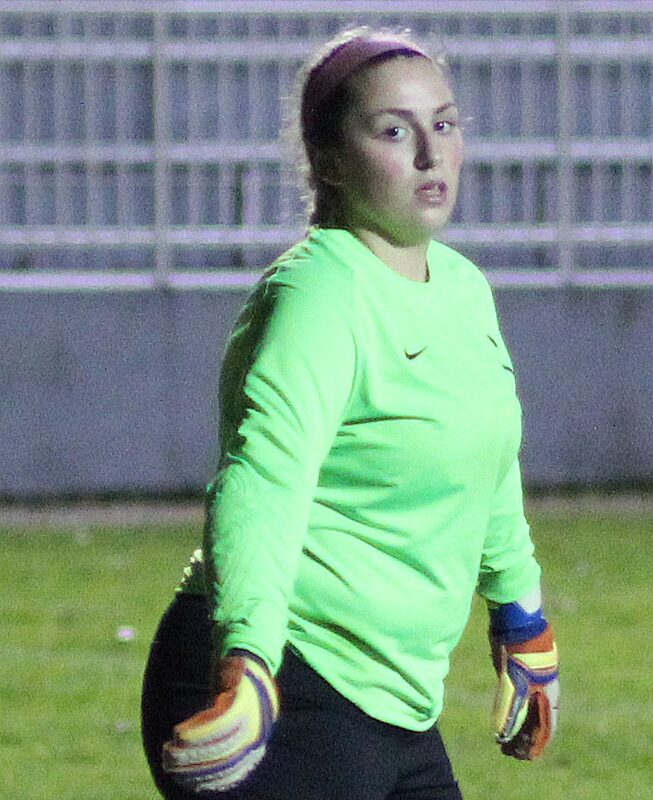 There was also a situation where Amesbury GK Alli Napoli had the ball get away from her after attempting a save. 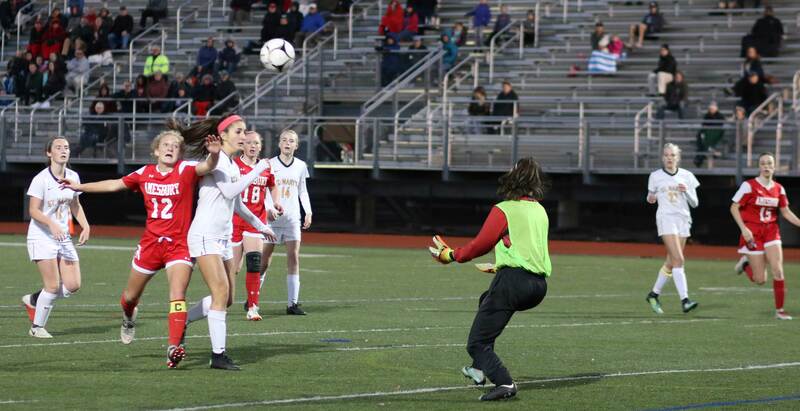 The ball was loose close to the corner and a St. Mary’s player was about to take a shot at an unguarded net but three Amesbury players slid in to block any straight shot at the goal. 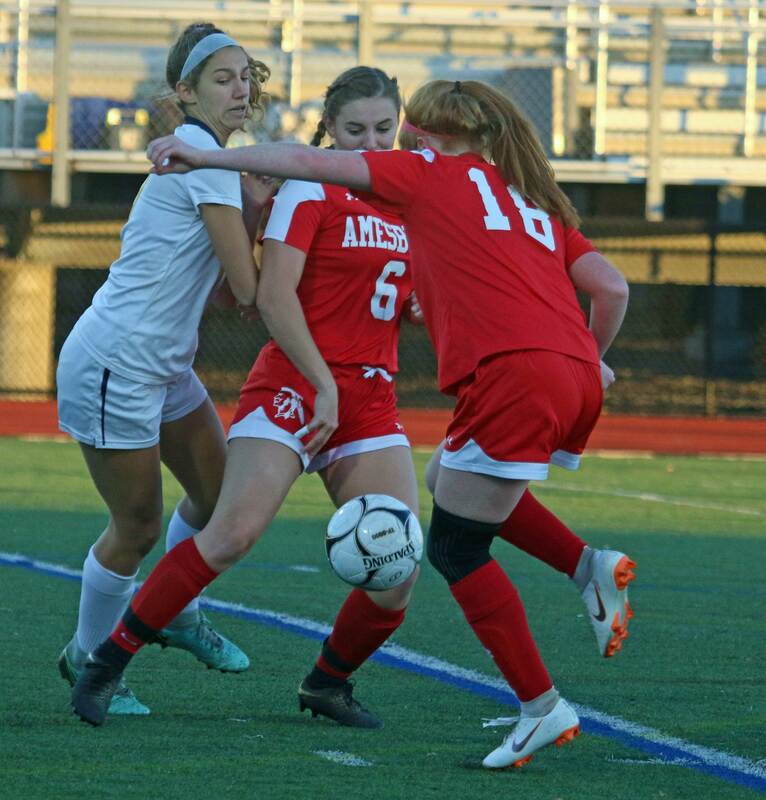 That’s what makes Amesbury so tough: Not only are they fast into the attacking zone but they are also fast to get back to help on defense. 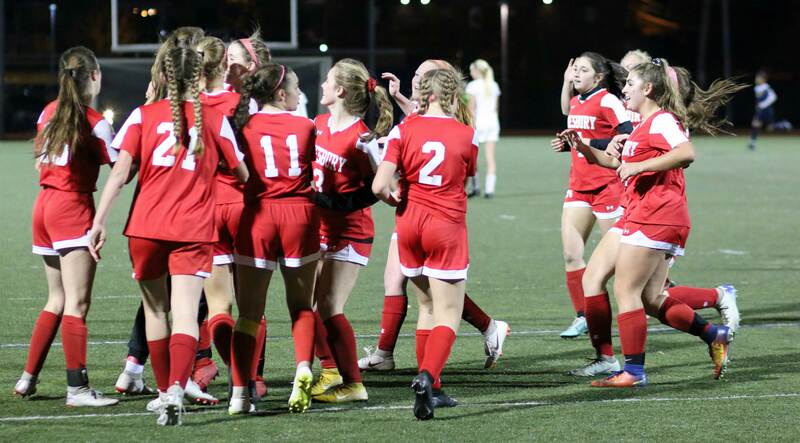 The #6 Indians will meet #2 Essex Tech in the semifinals on Wednesday night at Manning Field in Lynn. 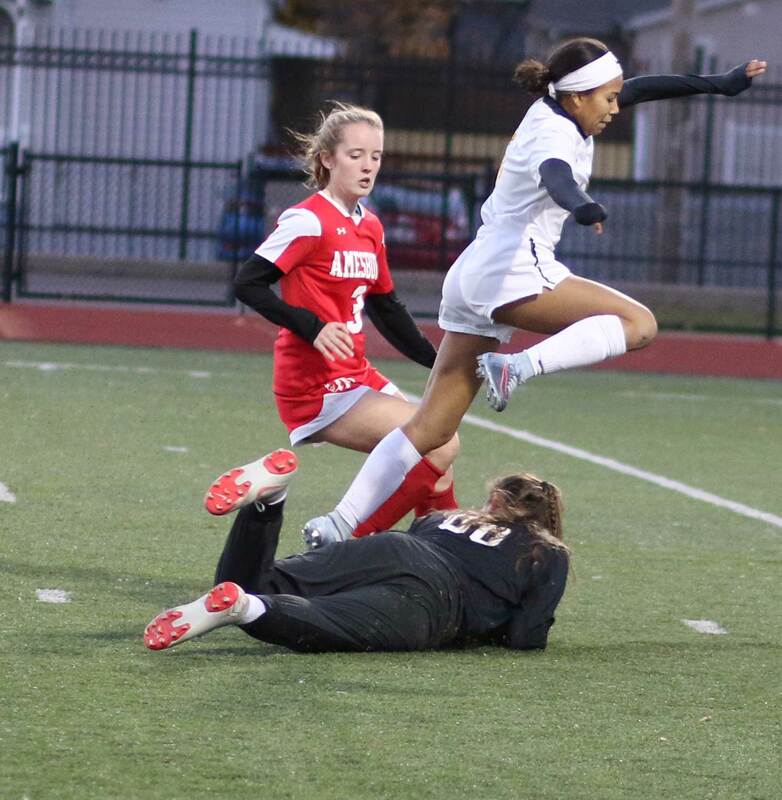 Hannaih Burdick’s goal was set up by Emma DiPietro seventeen minutes into the first half. A throw-in from the left side reached Emma. Instead of trying to go toward the goal, Emma passed further right to an uncovered Hannaih. The shot was a long one but Hannaih had experience taking it from that far out. 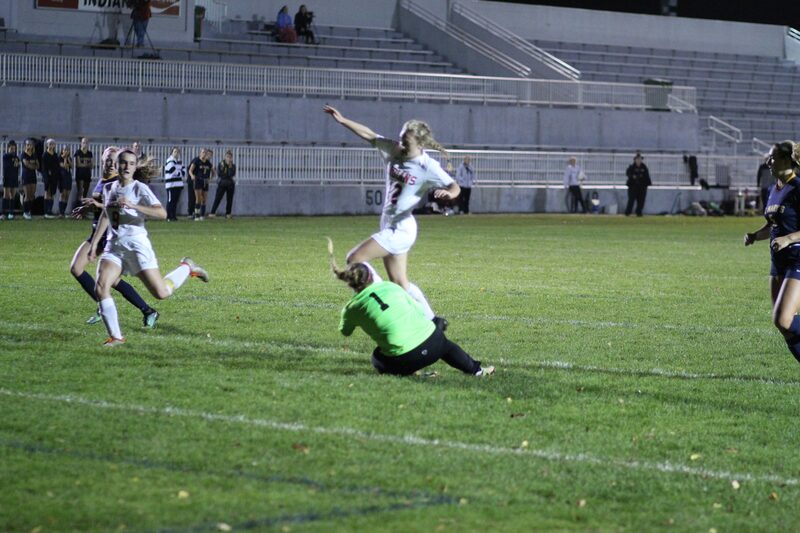 The shot was a high one and sailed into the top of the net on the left side. “I thought that the shot had gone over the net,” recalled Hannaih afterwards. 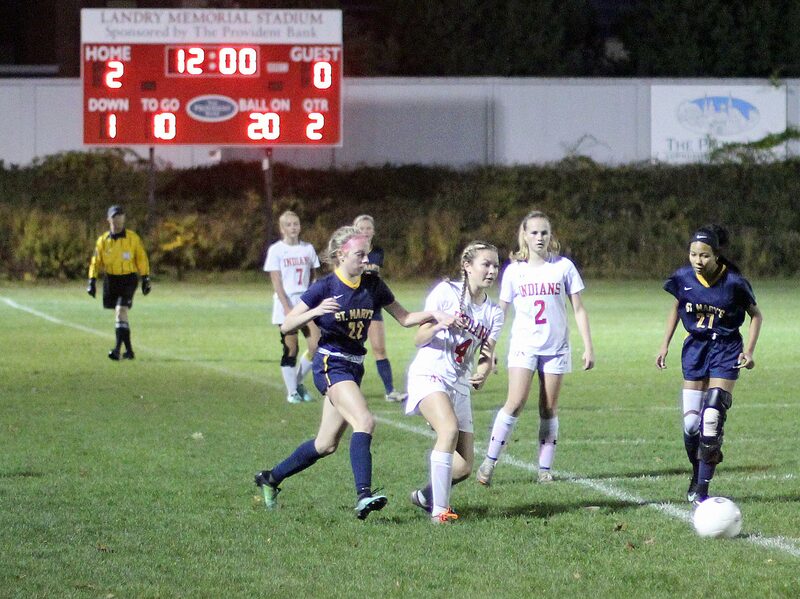 The second Amesbury goal was set up by Chelsea Lynch. Down the middle she came with defenders on either side. Alex Iacoviello came out to challenge and Chelsea’s shot bounced off her and over her. The ball headed ever so slowly toward the net. 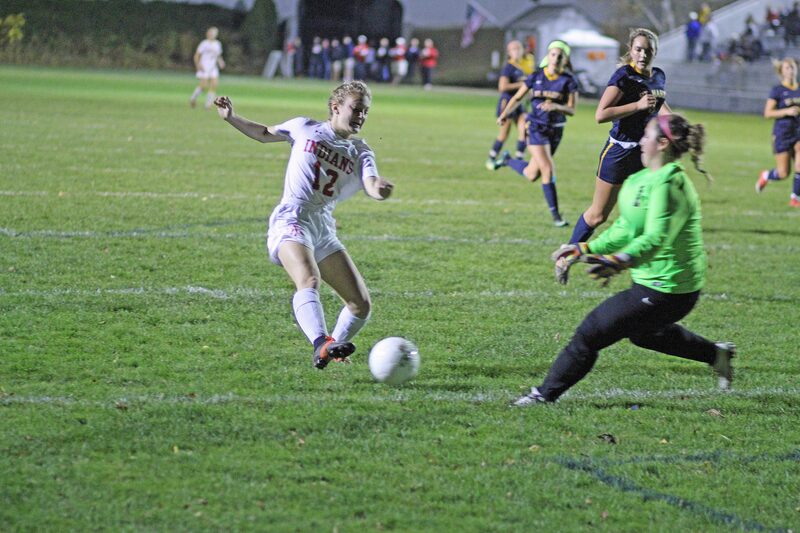 Michaela Halloran saw it and tapped it just enough to get it across the goal line. 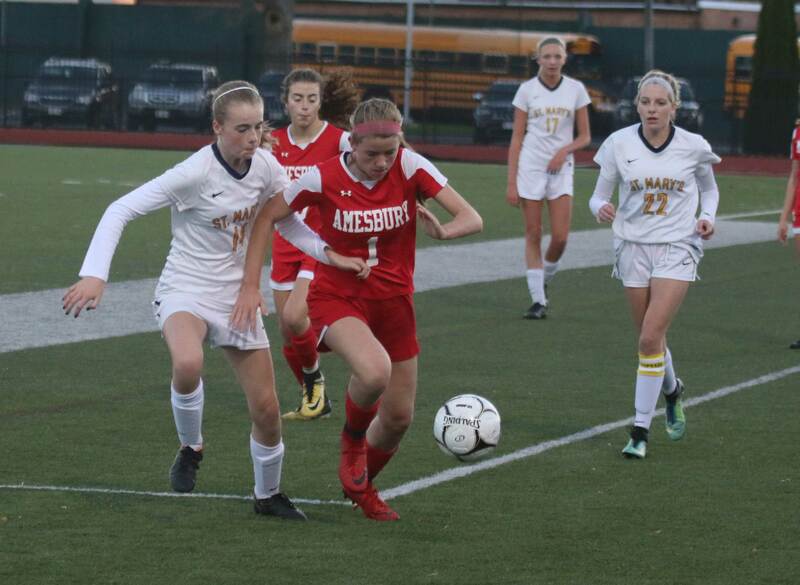 Michaela and Morgan Mackie battled for possession inside the net, but the goal had already been scored. 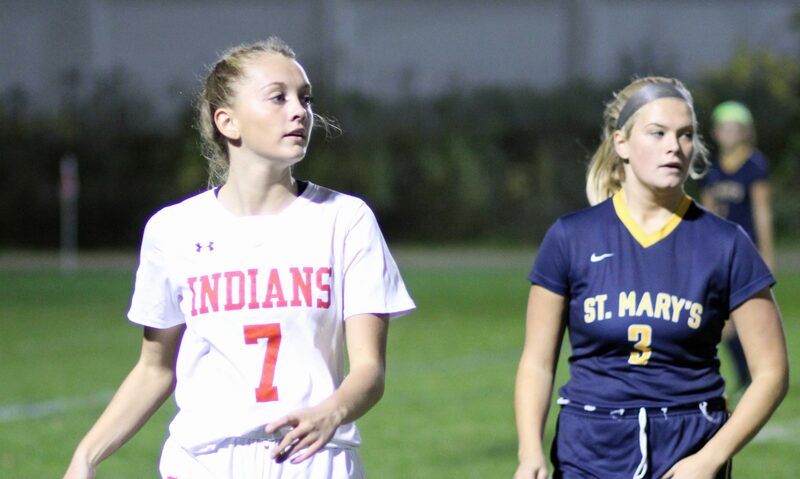 In the second half, St Mary’s (9-8-3) couldn’t get the goal that would have made things more interesting down the stretch. “We’ve had trouble scoring all season,” added Coach Foley. The speed of Amesbury has been noted. Also important is to have players in the midfield who have the dribbling skills to make players miss. Most opponents attack someone with the ball at full speed. The talented players often make those attackers miss by pulling the ball back. Those of us who enjoy watching Charlie Brown attempt to kick a football with Lucy holding the ball know what I mean! 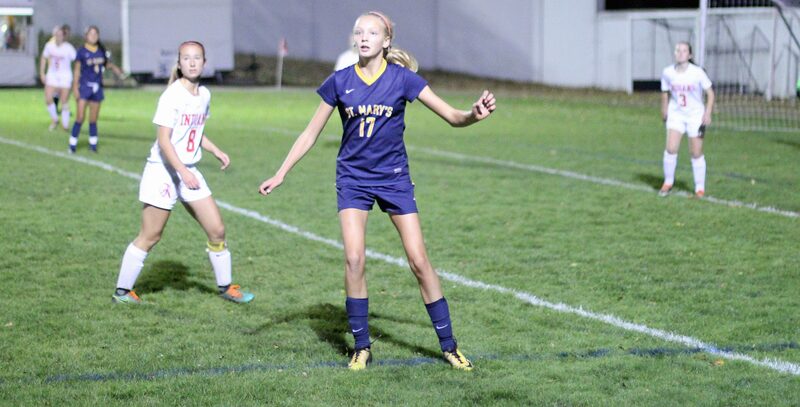 Midfielders Ashley Pettet and Emma DiPietro make players miss on a regular basis. 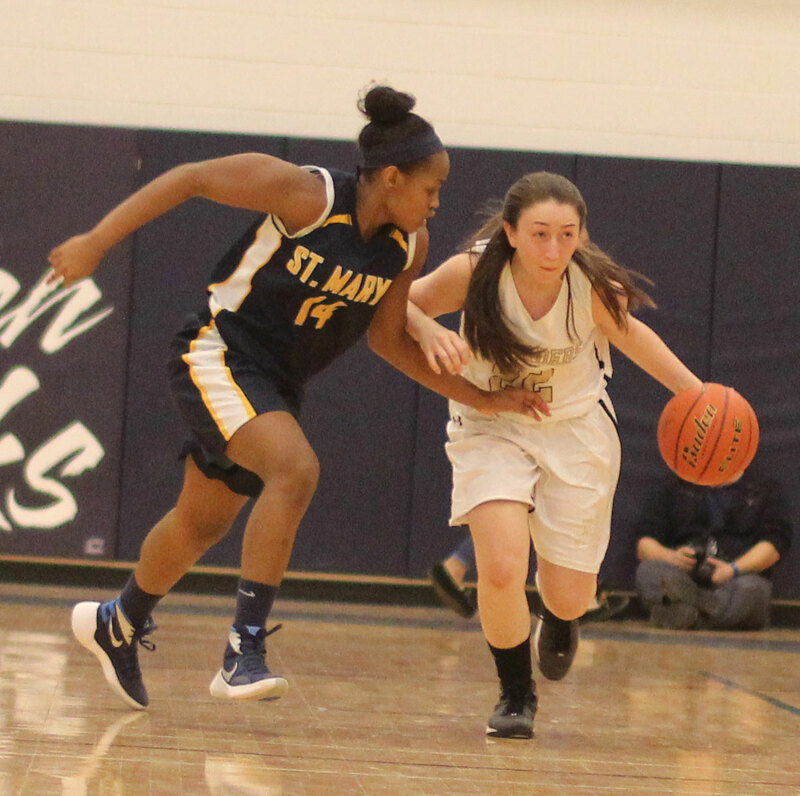 Morgan Mackie was a standout on defense for St. Mary’s. Part of the scoreboard was not working. The lighting in Landry will test the quality of the best of cameras. Pleasant night in the 50’s. Pretty good crowd for a Sunday night. Maddy Creps in for a testing shot that went just wide. 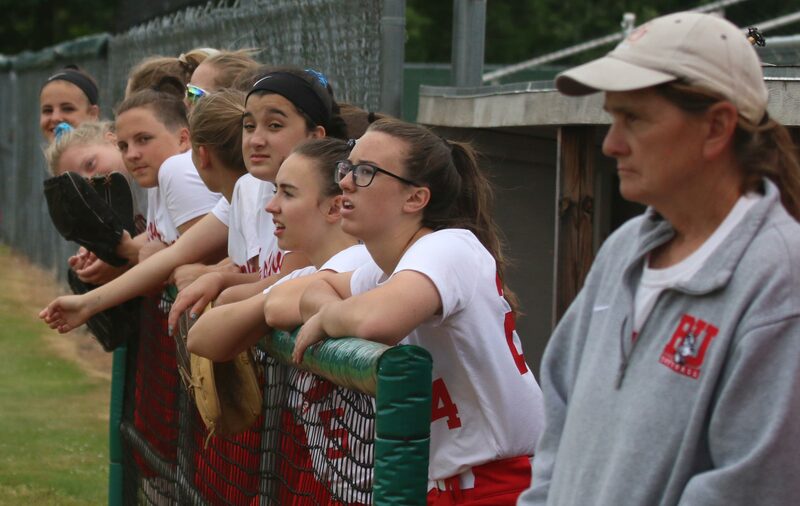 (Lowell MA) On Saturday, Amesbury fell behind by two runs in the first inning and came back to defeat Lowell Catholic, 3-2, in the D3 North semifinals. 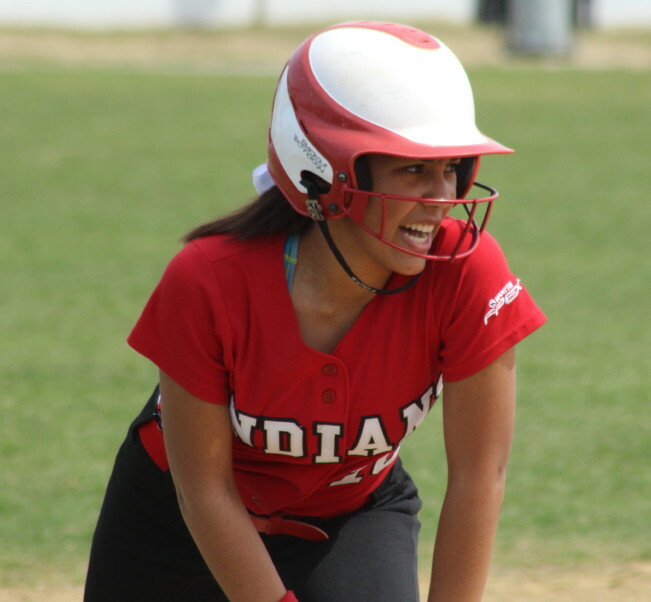 On Sunday, that fall-behind-thing didn’t work so well as the Indians trailed St. Mary’s (Lynn), 7-0, after two innings and ended up losing the Division 3 North title game, 8-5, to the Crusaders at Martin Field. 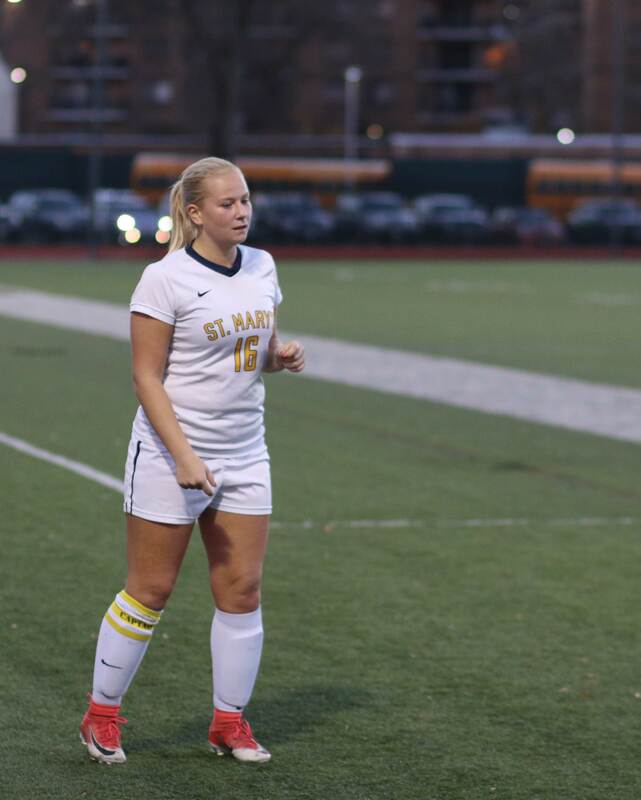 St. Mary’s moves on to the state semifinal game versus Greater New Bedford (South winner) on Wednesday night (5PM) back at Martin Field in Lowell. The Spartans (17-7) won state titles in 2009 & 2010. Last year they lost in the finals to Assabet Valley. 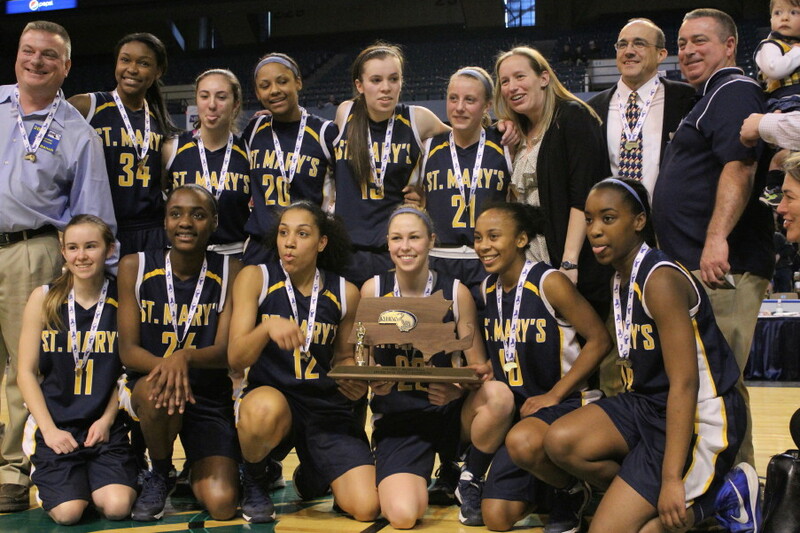 The most remarkable thing to me about past performance was that St. Mary’s has been in the D3 North finals for NINE straight years. If experience means anything in big games they have it. 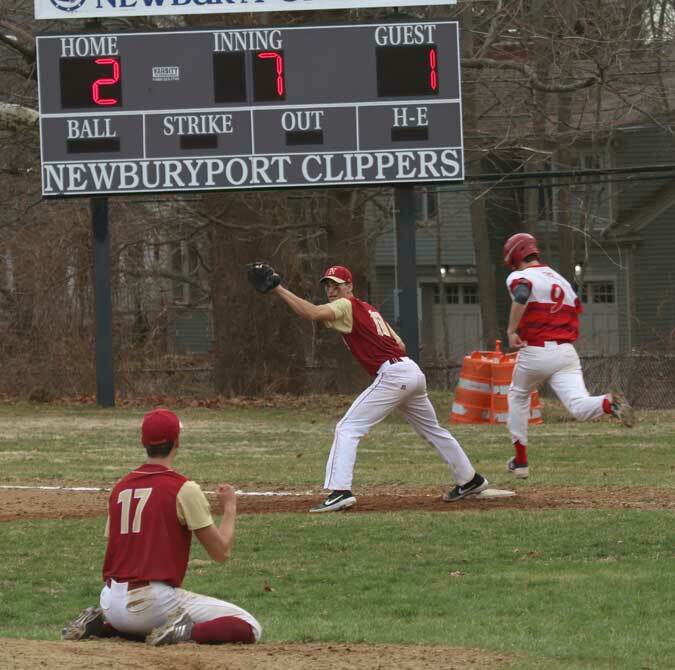 Amesbury (17-7), despite being down big early, never quit and put runners on base in the innings that followed and left the bases loaded in the fourth (after getting two runs) and in the seventh (after getting one run). 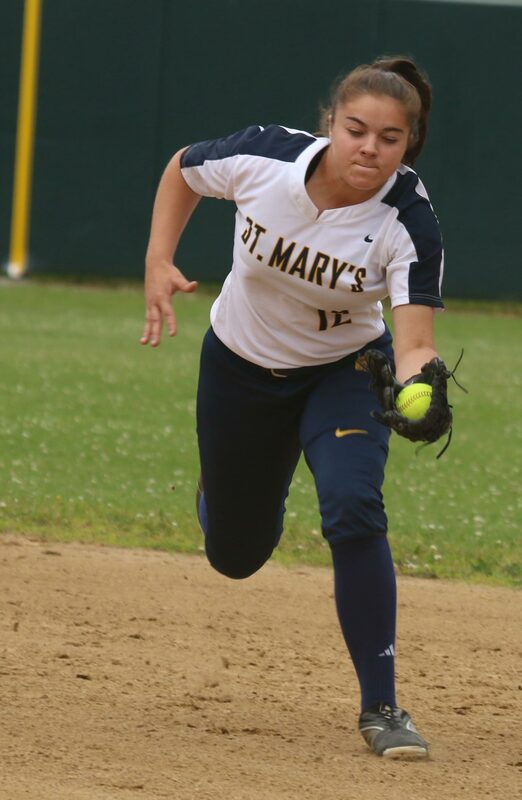 St. Mary’s picked up an insurance run in the sixth inning when Cassi LaFauci’s two-out double scored Alexis Mango with the Spartans eighth run. 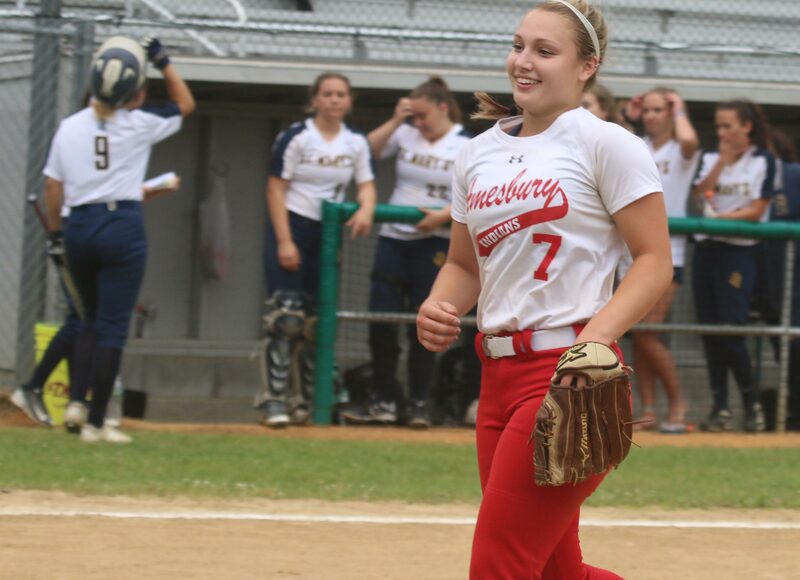 That run loomed large in the Amesbury seventh after reliever Mia Nowicki walked in the Indians fifth run with two outs and had to face the Cape Ann League’s MVP Amanda Schell. 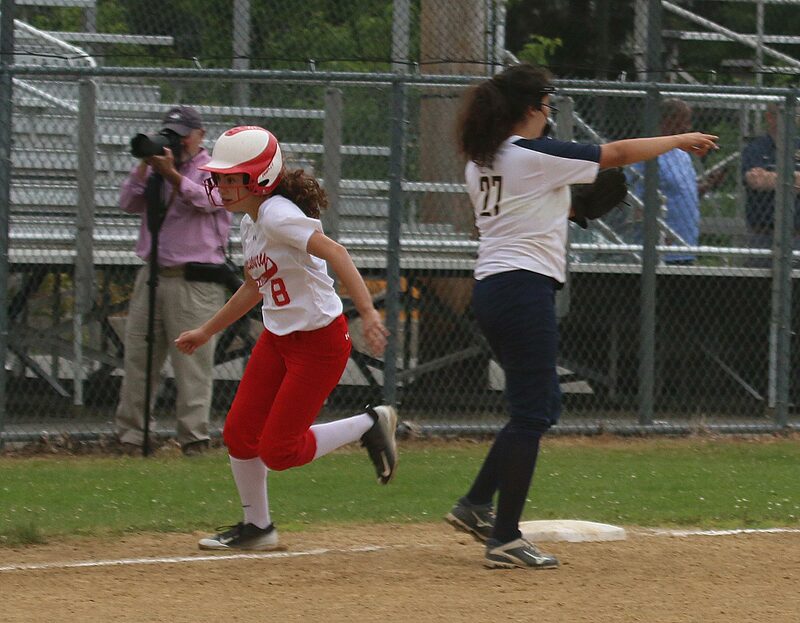 Mia escaped by getting Amanda to ground out to second baseman Jen Mucciarone to end the game. 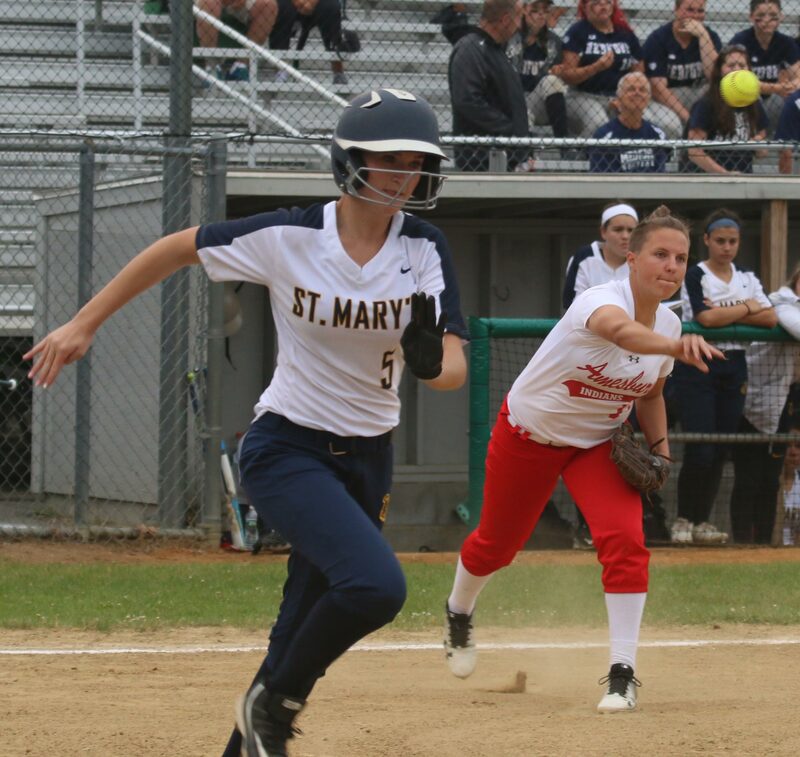 St. Mary’s totaled ten hits but had five of them in their seven-run second inning. 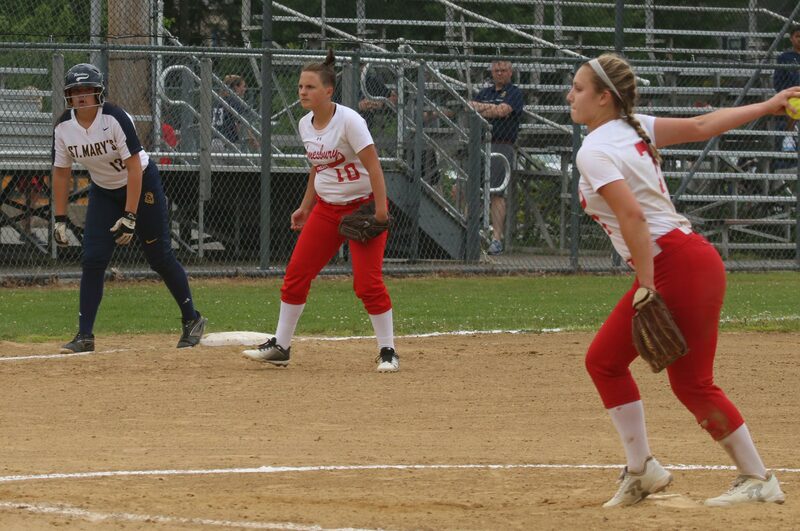 Amesbury had three errors in the game and unfortunately, for them, all three came in the second inning. In that second inning, the Spartans loaded the bases with two hits and a walk with one out. 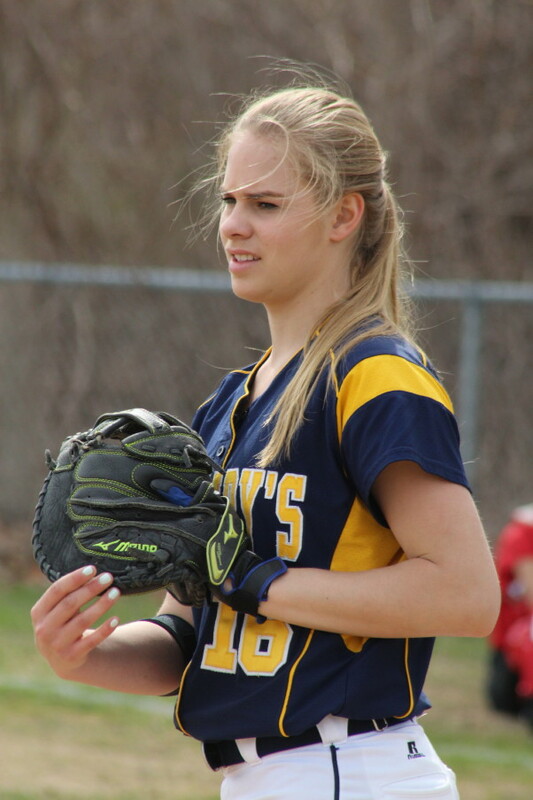 Pitcher Rachel Cyr then bobbled Jess Martinello’s grounder and Vanessa VanBuskirk scored. 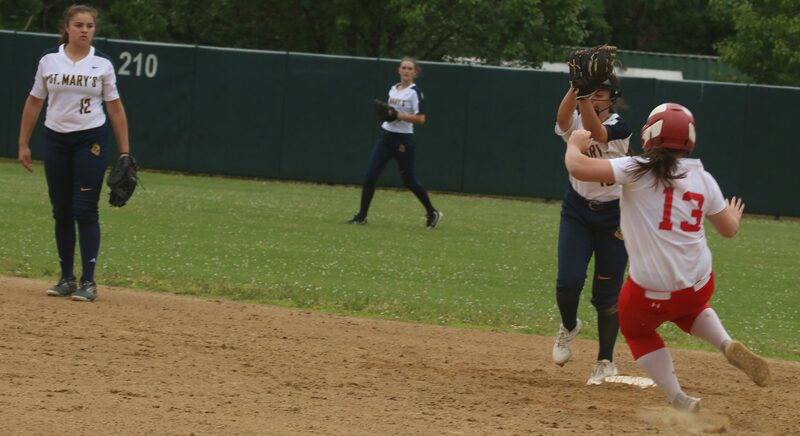 With two outs and the bases still loaded, another grounder and this time the throw home was over catcher Amanda Schell’s head and two runs scored. Later a single (Molly Doyle) to center went through CF Sam Stone allowing yet another tainted run. All seven runs were unearned. 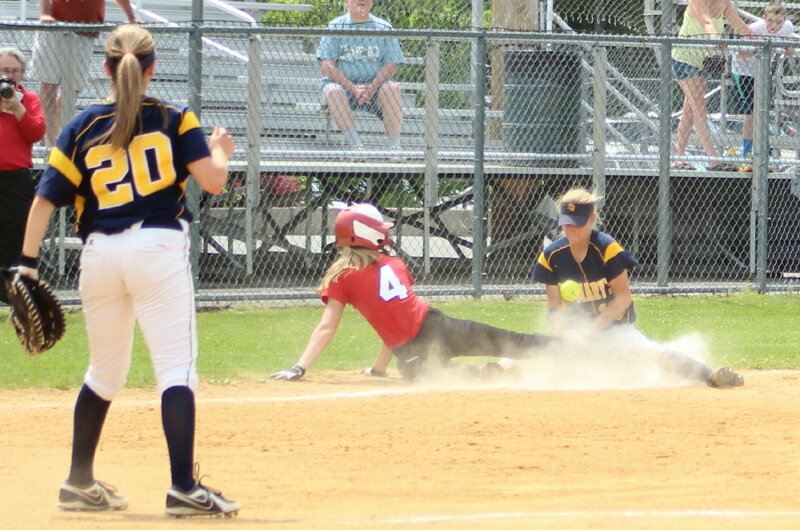 Amesbury began the long road back with two runs in the third and two more in the fourth. Autumn Kligerman and Rachel Cyr picked up RBI in the third. Jordan D’Orsi started the fourth inning for St. Mary’s. Consecutive doubles (Zoe Fitzgerald & Lauren Fedorchak) produced a run and after a walk Mia Nowicki came on in relief. 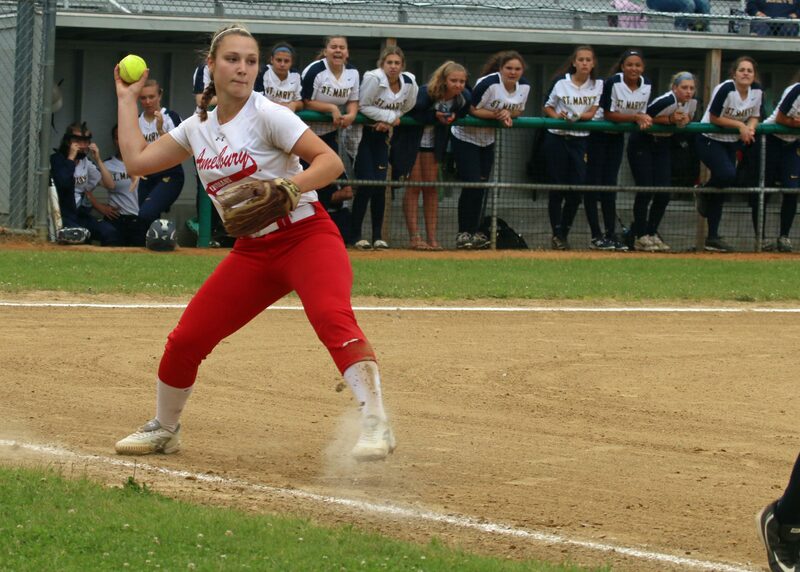 Mia hit the first batter (Amanda Schell) she faced and walked the next batter (Alexis Boswell) forcing in a run. 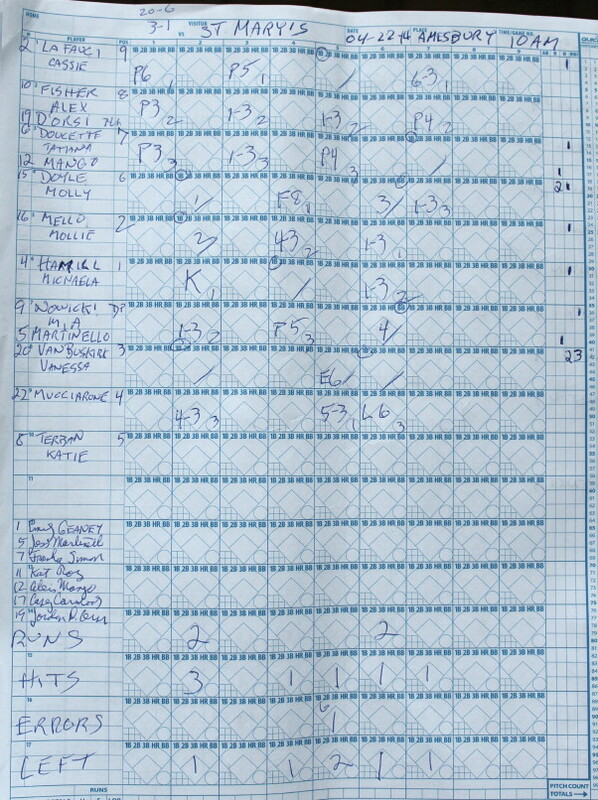 Here was a key point in this game: bases loaded with one out and Amesbury within three runs. 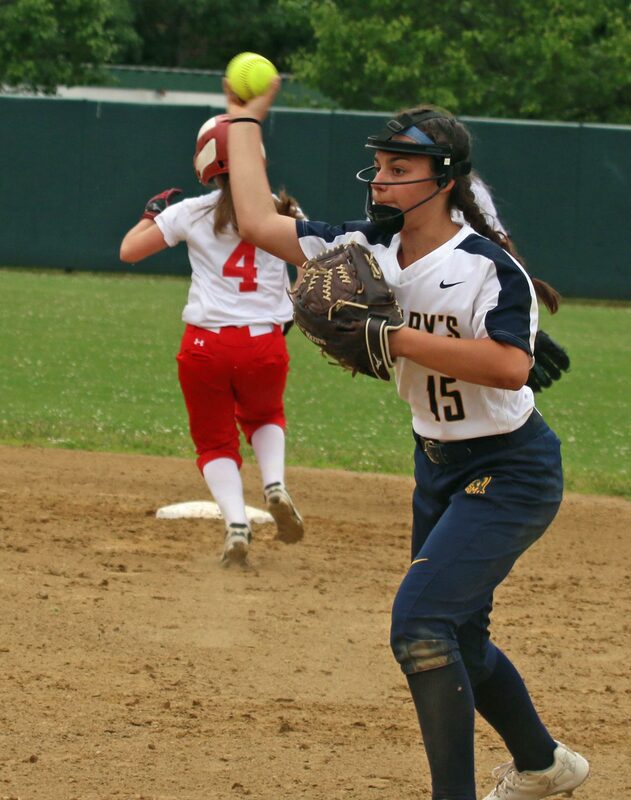 Mia, however, came up big for the Spartans registering a strikeout and a popout to escape further damage. 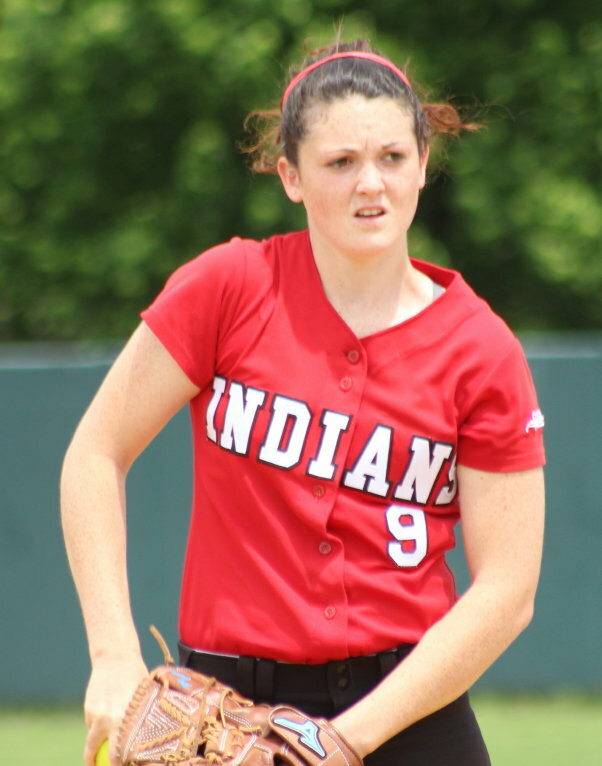 Mia Nowicki fanned seven Indians in her 3 2/3 innings of work. The freshman has plenty of speed and a devastating changeup. 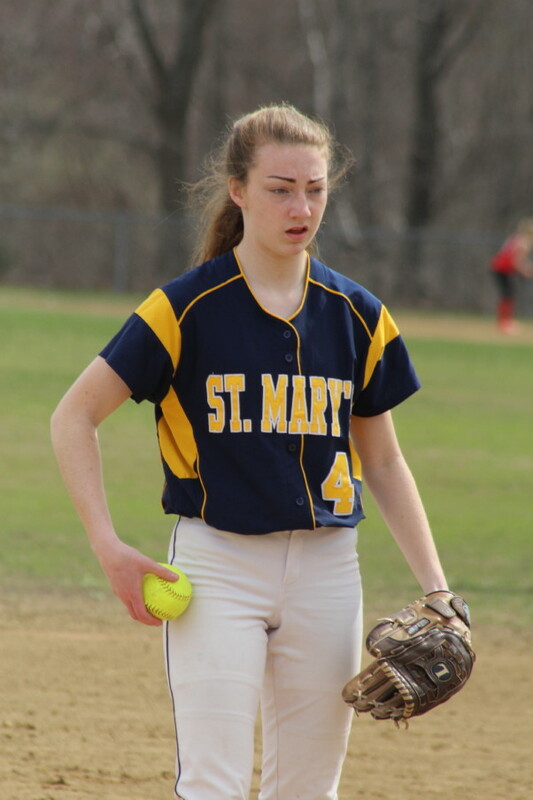 Michaela Hamill pitched three innings for St. Mary’s giving up two runs on five hits. 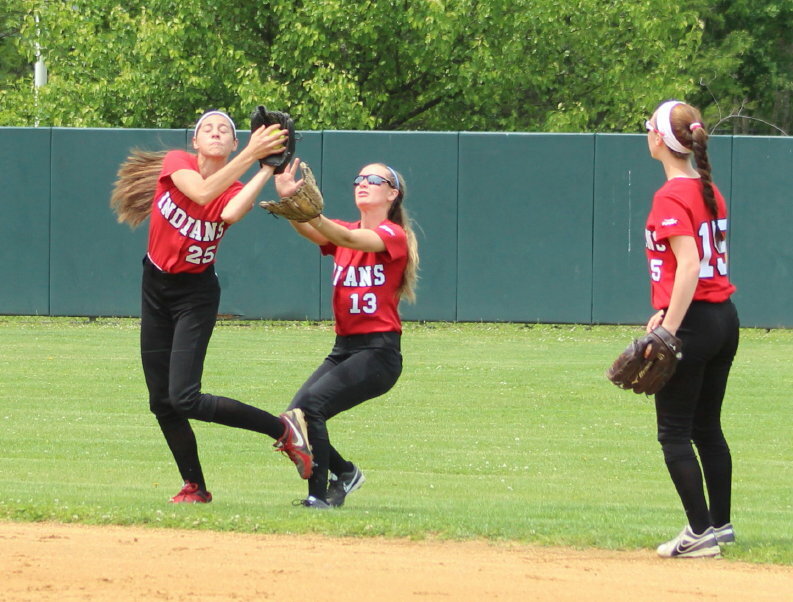 Third baseman Autumn Kligerman and second baseman Lauren Fedorchak had terrific catches on infield popups. 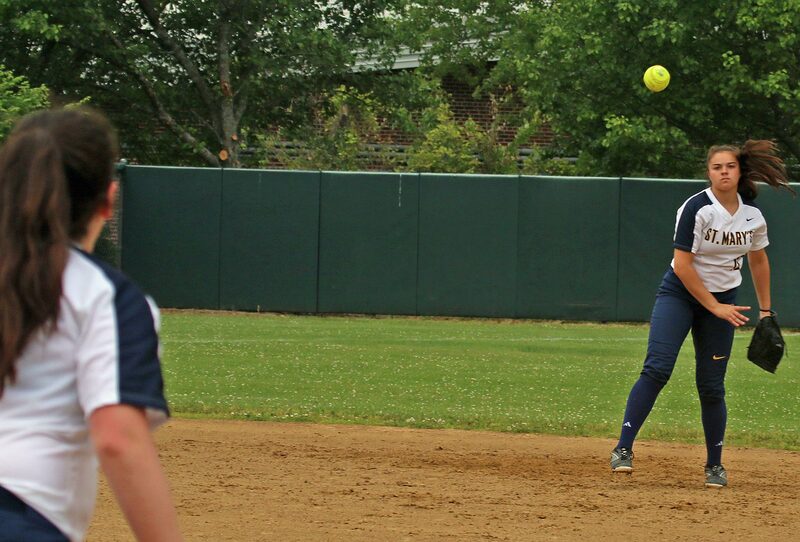 Alex Fisher, Alexis Mango, and Mollie Mello each had two hits for St. Mary’s. Lauren Fedorchak had two hits, scored a run, and had an RBI for Amesbury. 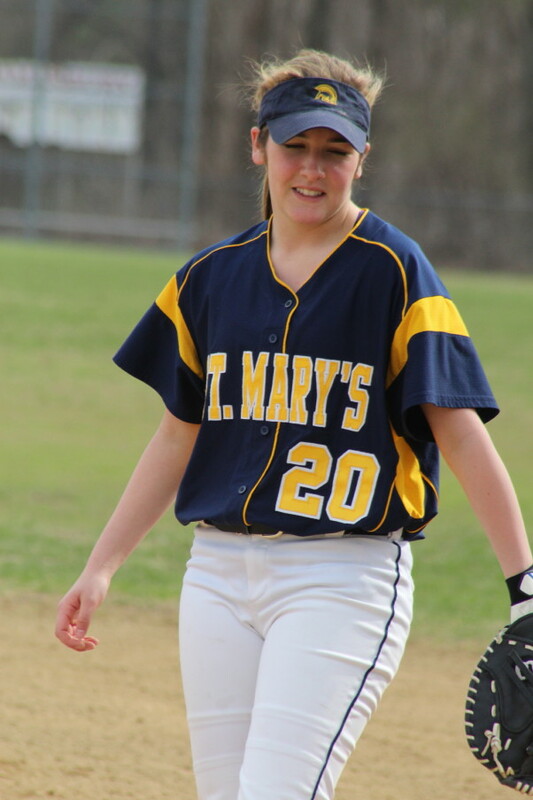 St. Mary’s won an April 22nd game versus Amesbury, 4-1, at Amesbury. 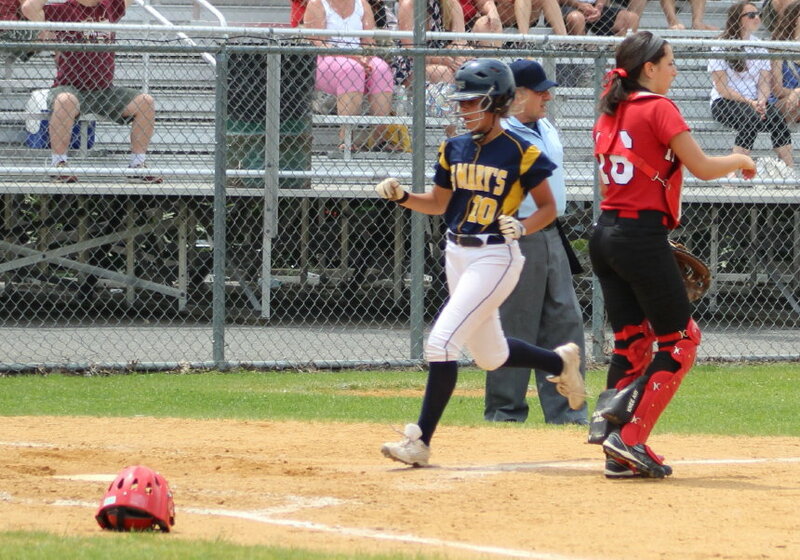 Vanessa Van Buskirk had three RBI in that one. Weather? Sunny/Cloudy with an off-and-on breeze. (Amesbury MA) Amesbury didn’t make a full recovery from the nightmarish 16-15 loss to Newburyport last game but their improved play was noticeable. 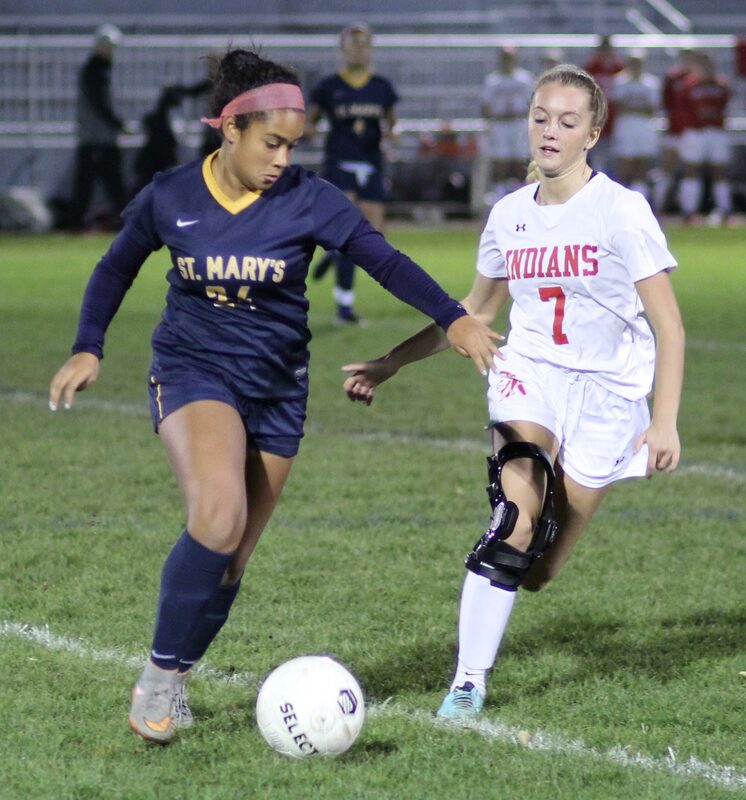 The Indians (2-2) lost, 4-1, to a very strong St. Mary’s (Lynn) team in a non-league game on a beautiful Tuesday morning. 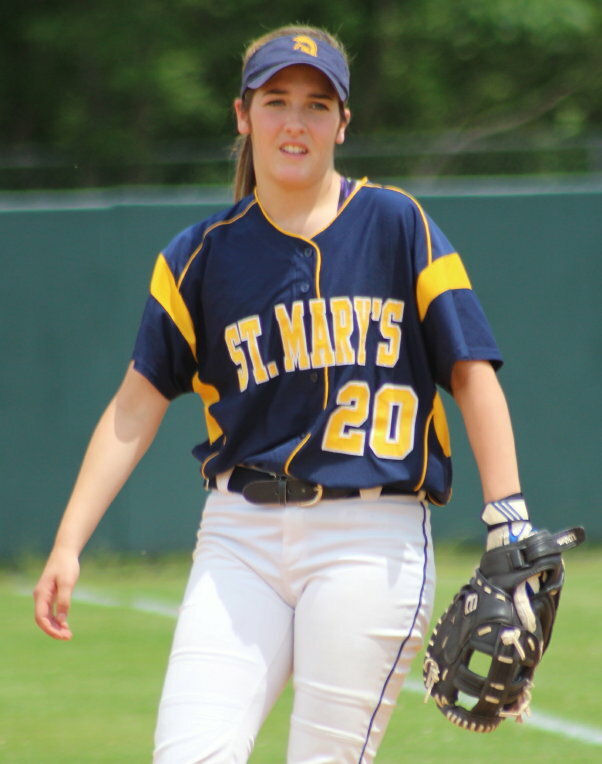 Sophomore Vanessa VanBuskirk drove in three runs for St. Mary’s (4-1). 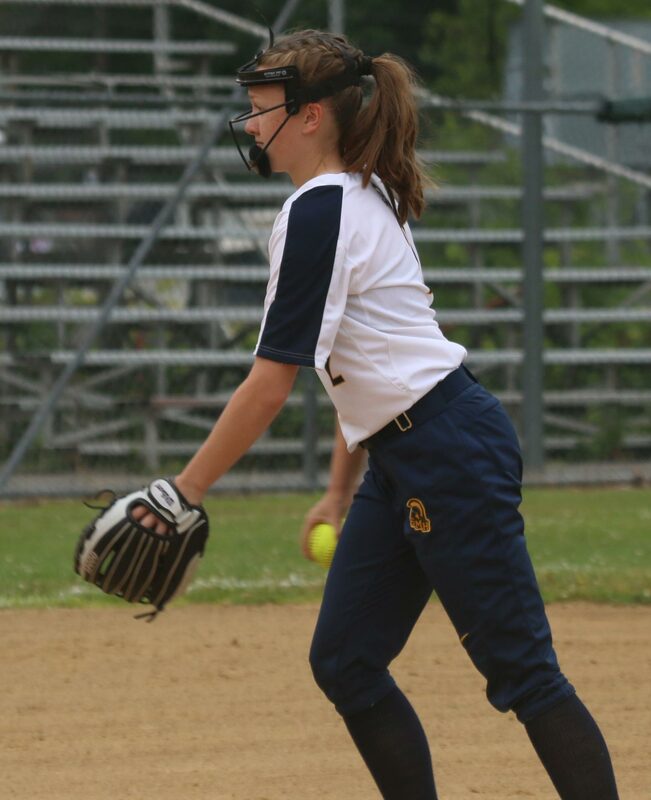 The Spartans pitching (sophomore Michaela Hamill and freshman Mia Nowicki) gave up seven hits but it was their ability to strand nine Indians that made the difference. 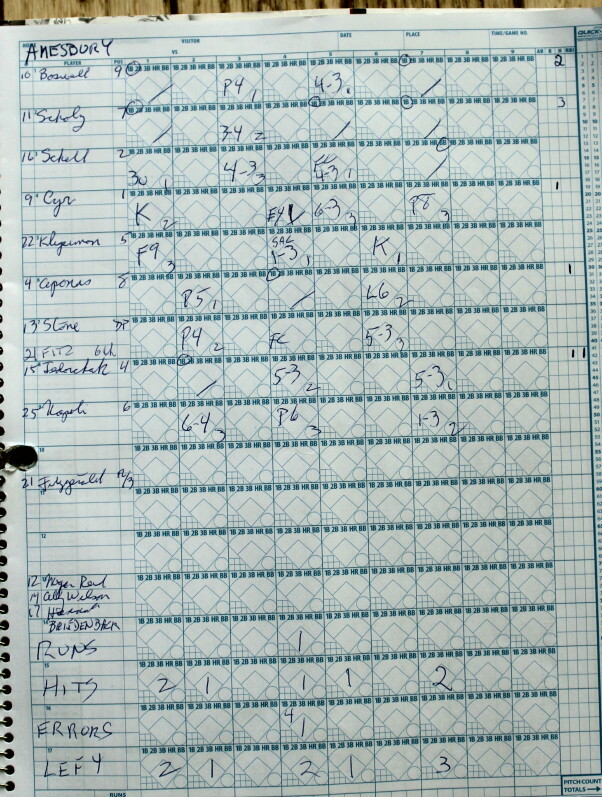 Twice St. Mary’s pitchers were confronted with bases-loaded situations but yielded just one Amesbury run. The Spartans scored two runs in the second and two more in the sixth. The Indians collected their lone run in the fourth. 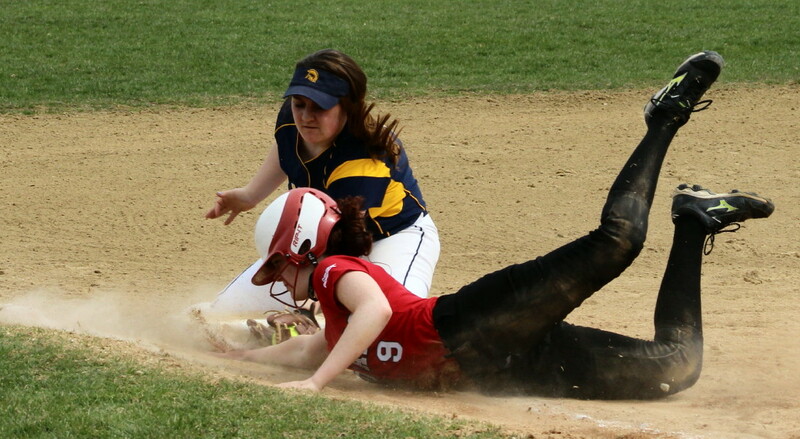 Pitcher Rachel Cyr gets one of her seven assists. Rachel Cyr went the distance for Amesbury and pitched well. The senior was victimized by a trio of infield bleeders in StM’s 2-run second and two walks in the 2-run sixth. 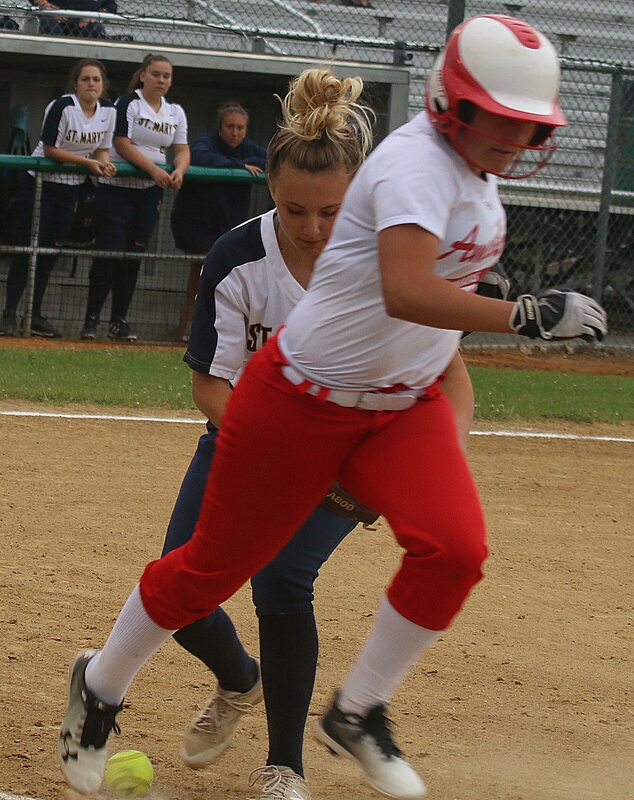 In the Spartans’ second inning, juniors Molly Doyle and Mollie Mello reached on slow rollers that neither AHS shortstop Maddie Napoli nor third baseman Autumn Kligerman had easy chances on. (Senior Alexis Mango ran for Mollie Mello.) 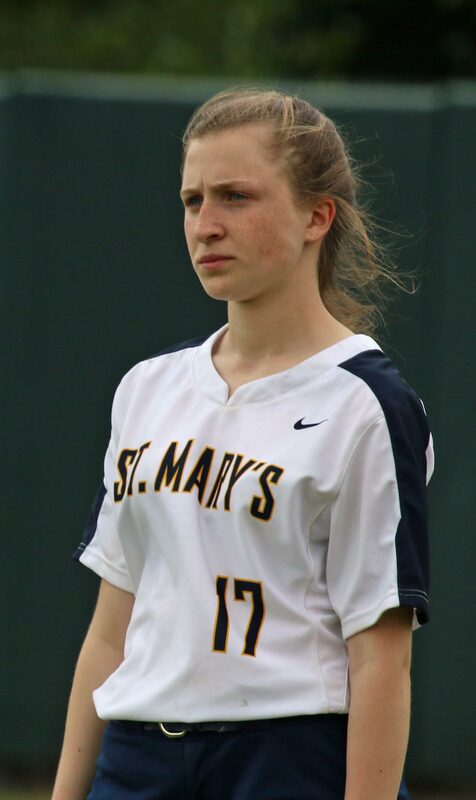 A wild pitch moved both runners up and Mia Nowicki’s grounder to pitcher Rachel Cyr enabled Molly Doyle to score St. Mary’s first run. Alexis Mango reached third on the play. 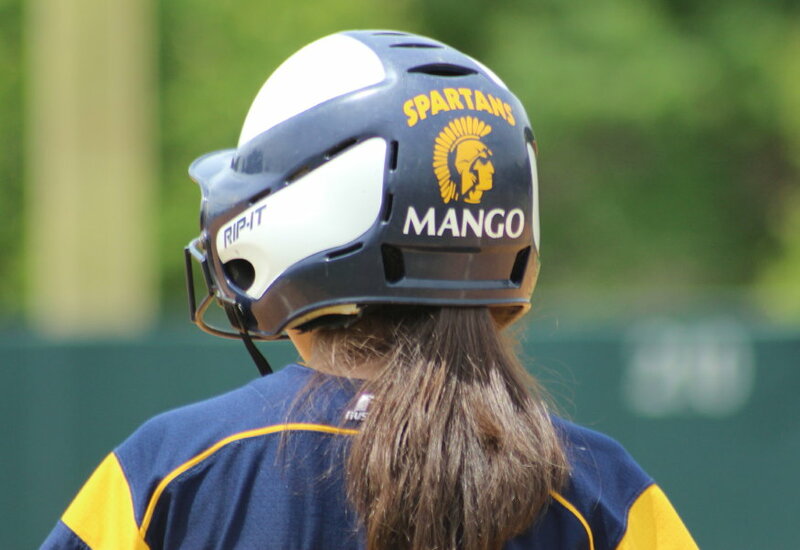 Vanessa VanBuskirk then hit a blooper over the pitcher, but in front of the shortstop, with plenty of spin on it that fell in and drove across the Spartans second run. 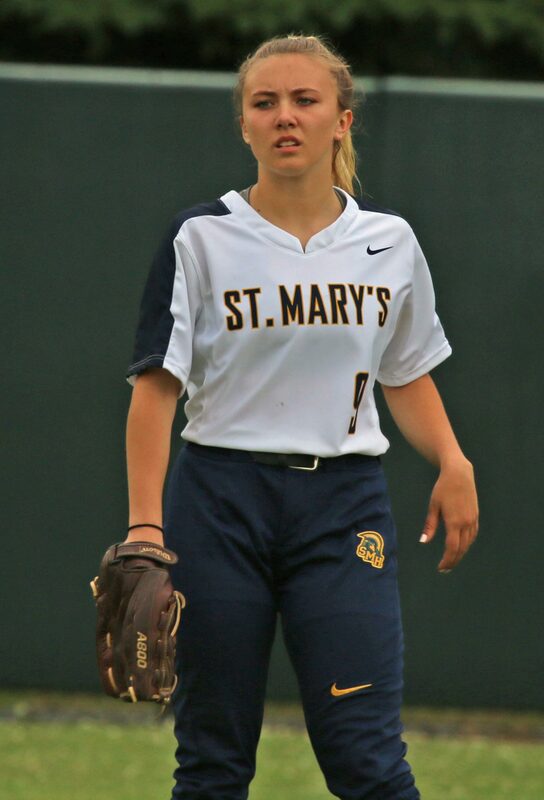 Nothing was hard hit but St. Mary’s was up, 2-0, after two innings. Amesbury cut the lead in half in their fourth inning and came very close to having an even bigger inning. 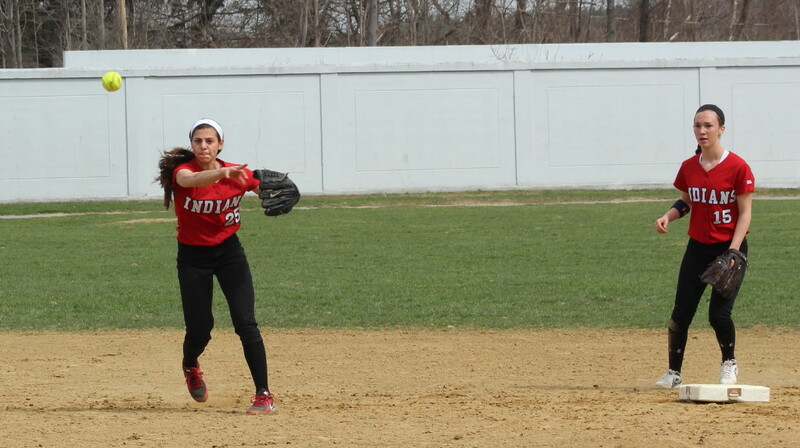 Rachel Cyr started things off by reaching on a dropped popup by senior second baseman Jennie Mucciarone. Autumn Kligerman bunted Rachel to second. 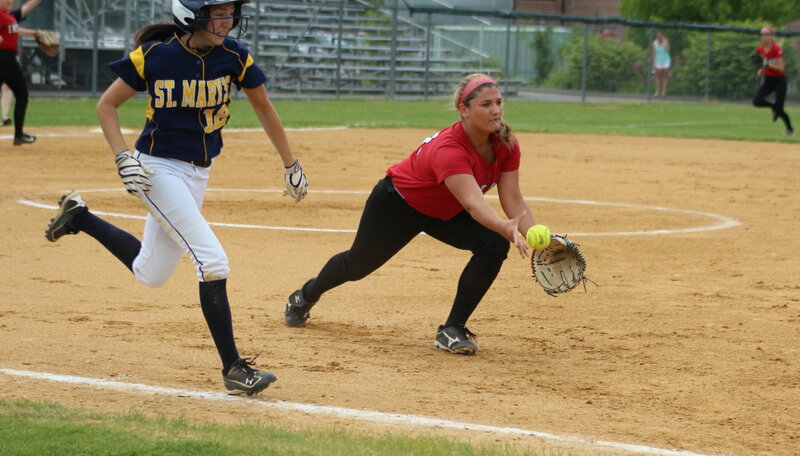 Next batter junior Meagan Aponas took a full swing and got a dribbler to go down the first baseline. 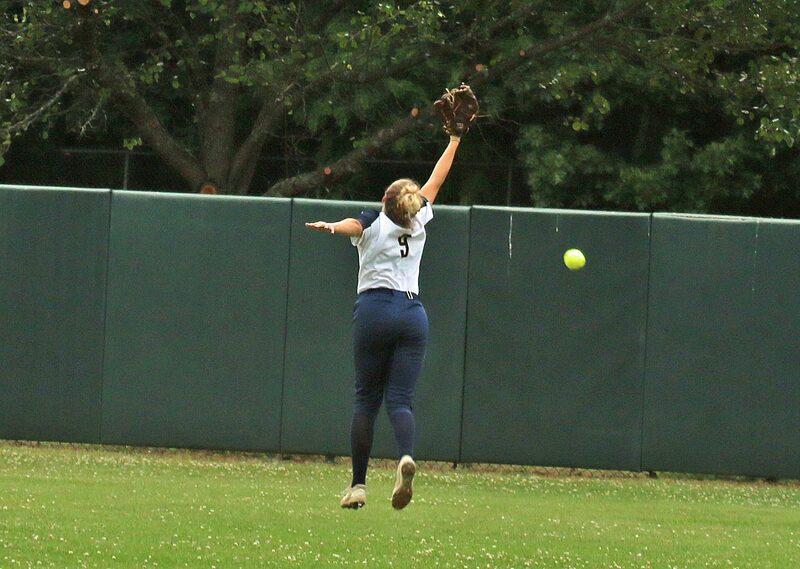 None of the St. Mary’s fielders reacted to it and so Meagan reached first. Sophomore Sammy Stone then hit a grounder back to pitcher Michaela Hamill who tried unsuccessfully to get Rachel Cyr off of third. So Amesbury now had the bases loaded with just one out. They did get a run as Lauren Fedorchak’s fielder’s choice scored Rachel Cyr but Michaela got freshman Maddie Napoli to pop out ending what might have been a much bigger inning. Mia Nowicki pitched the final three innings for the Spartans. 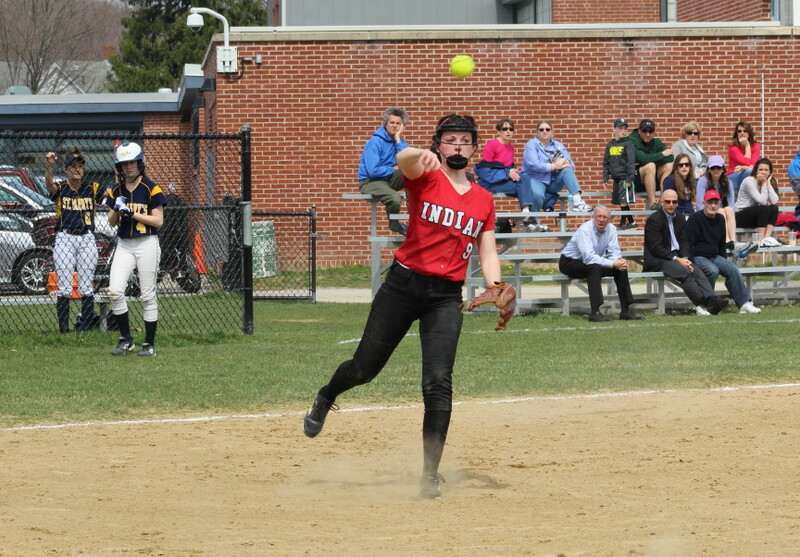 Against Mia in the fifth, the Indians got senior Lucy Scholz (3 hits) to third with two outs but failed to capitalize. The Spartans put up two runs worth of insurance in the sixth inning. 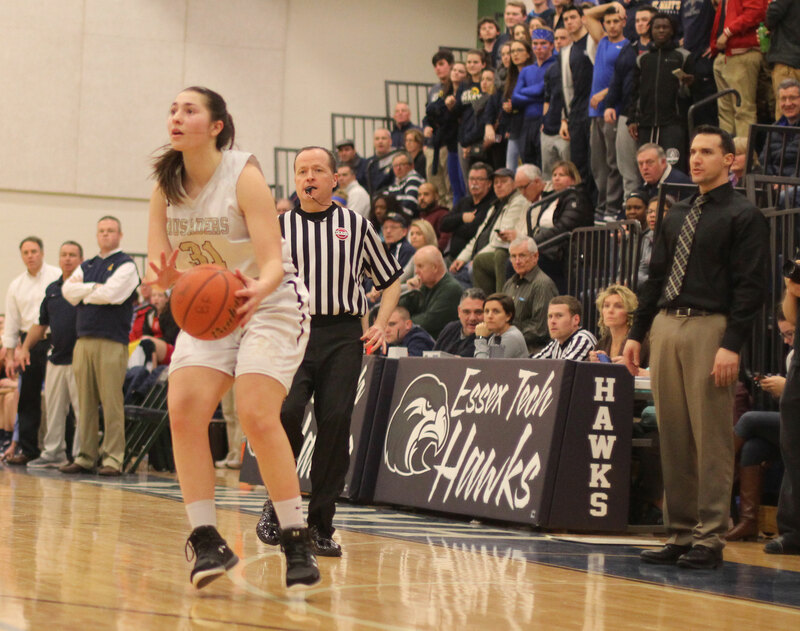 Rachel Cyr’s only two walks of the game proved costly. 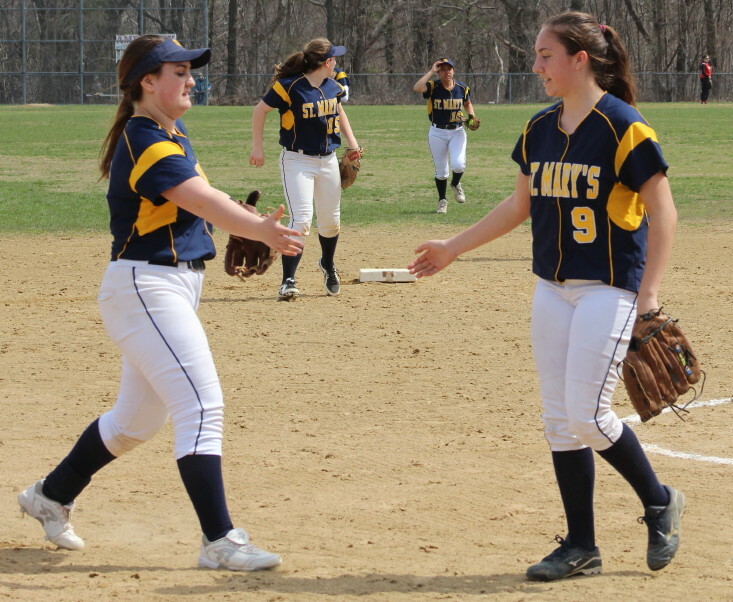 With two outs, St. Mary’s runners (Molly Doyle and pinchrunner Jess Martinello), who had reached on walks, were on second and third. 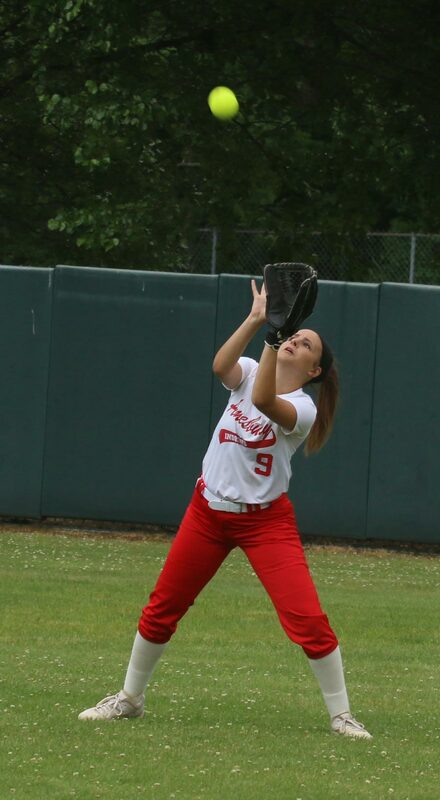 Vanessa VanBuskirk delivered the two of them with a hard shot to centerfield. Amesbury trailed, 4-1, with two out in the bottom of the seventh. 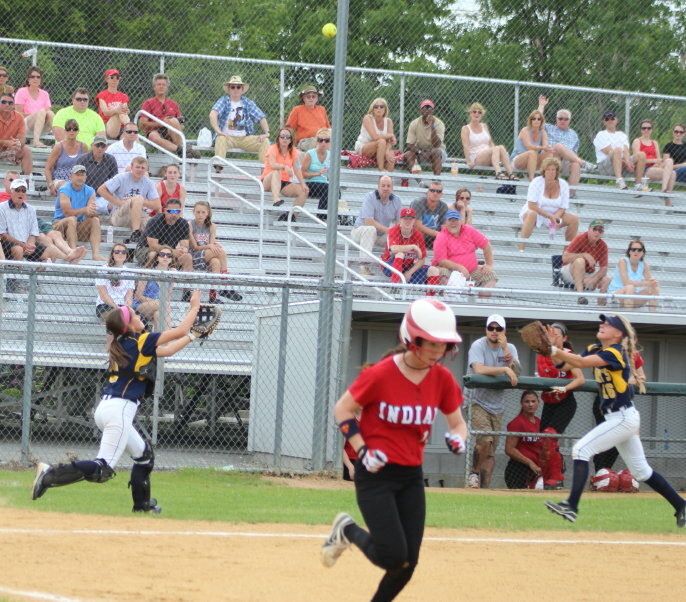 But the Indians didn’t go quietly getting consecutive hits from Alexi Boswell and Lucy Scholz. Amanda Schell extended the inning with a walk loading the bases. 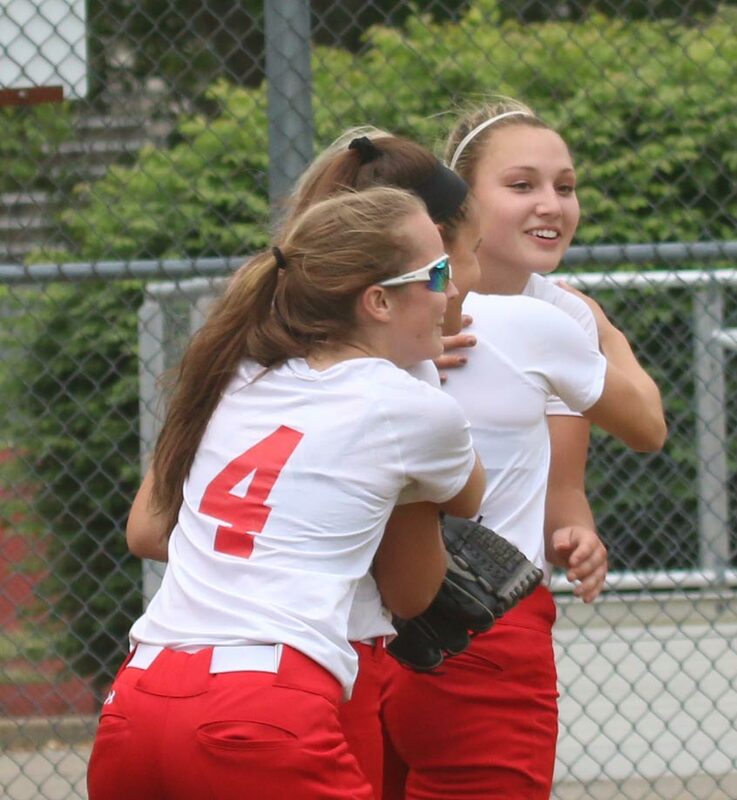 However, Mia Nowicki got Rachel Cyr to fly to senior centerfielder Alex Fisher to end Amesbury‘s hopes for a last-inning comeback. 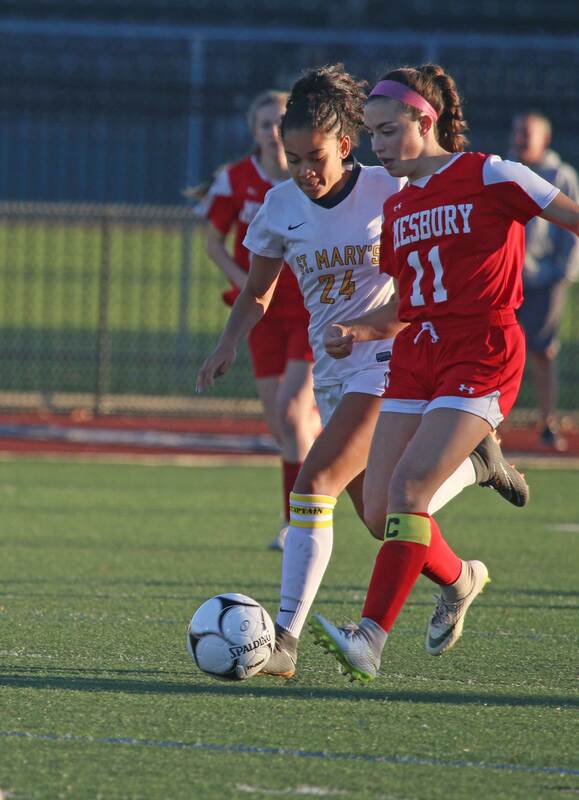 Amesbury is now in Division 3 as is St. Mary’s so it was a good chance for both teams to check each other out for a possible D3 North tournament game later on. 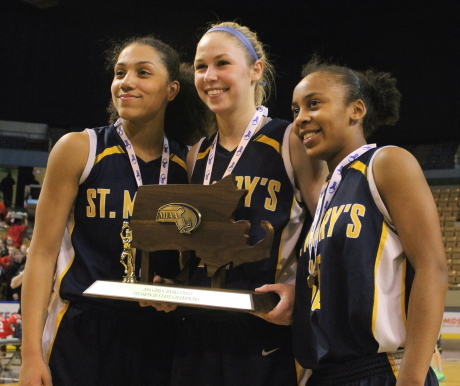 Jennie Mucciarone (going to Tufts) was part of St. Mary’s D3 basketball state champs as was Mia Nowicki. 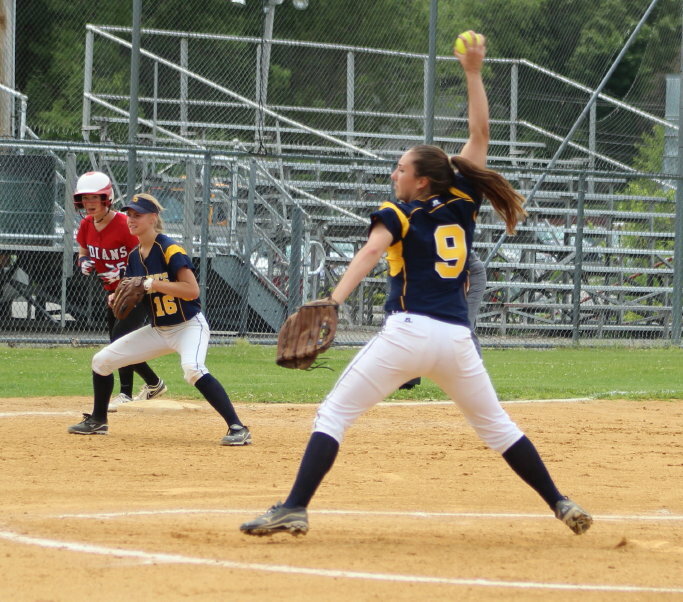 Pitcher Rachel Cyr had seven assists. 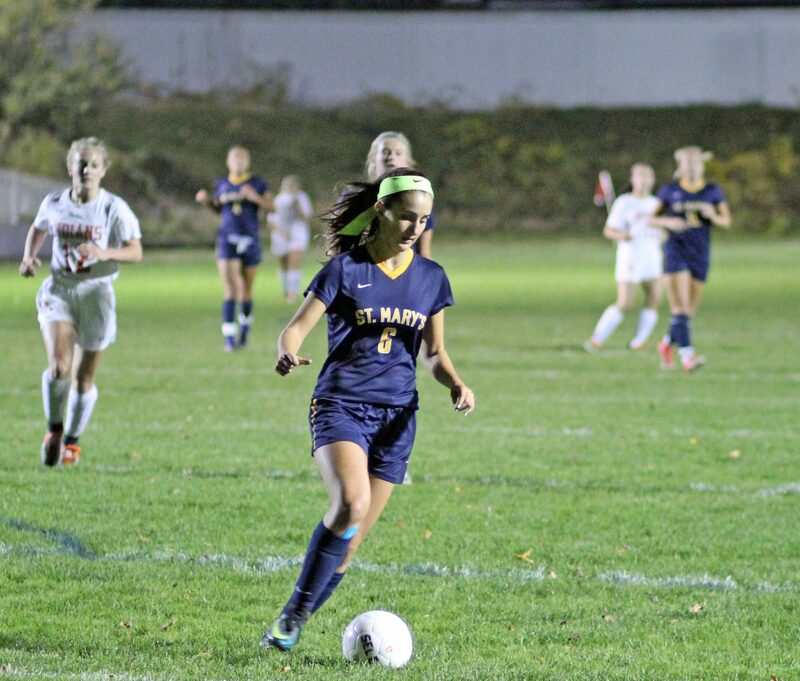 St. Mary’s reached the state D3 final last year before losing, 5-2, to Assabet Valley. The Spartans were 20-6 last season. Amesbury was 19-3 in 2013 but in Division 2. Amesbury is scheduled to visit Ipswich tomorrow for a 10AM game……..weather permitting. Weather? It is nice to go to an outdoor event in April and feel over-dressed. This was one of those mornings. 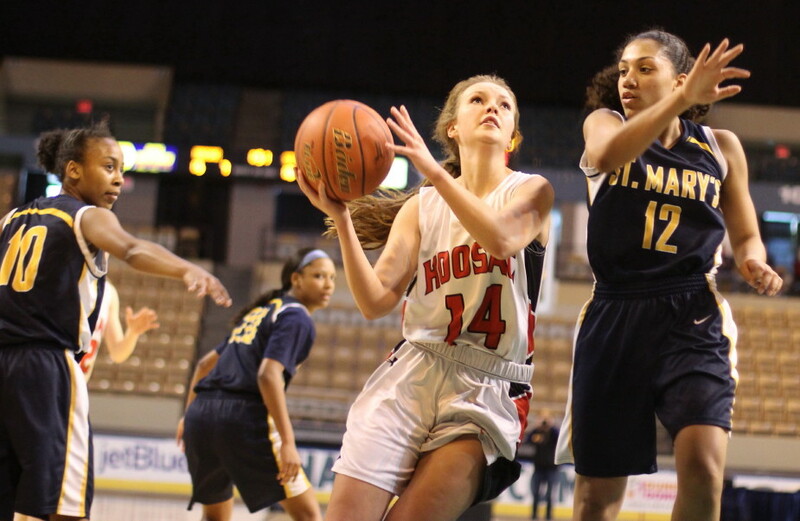 (Worcester MA) Hoosac Valley’s plan was to use their speed, force turnovers and make three’s. Those three had carried the Hurricanes to a 23-win season. 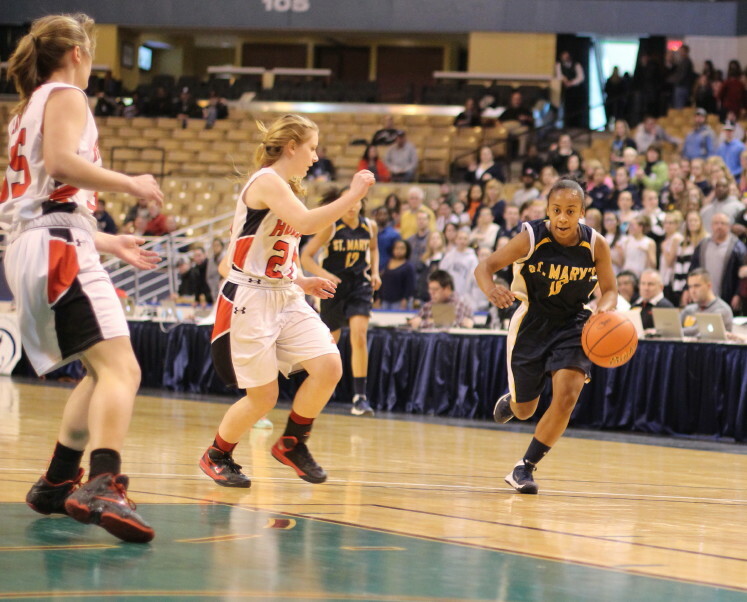 Then along came St. Mary’s in the Division 3 state finals on Saturday morning at the DCU Center in Worcester. Nothing worked for the team from Cheshire and they were buried by the Spartans from Lynn, 74-36, ending a seventeen-game winning streak. 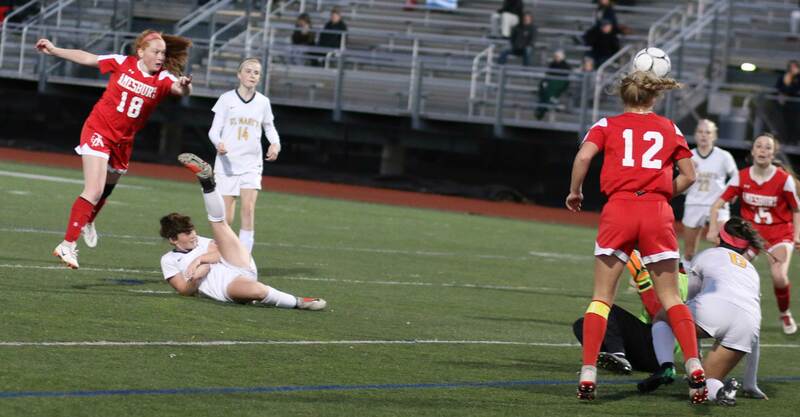 It didn’t take Brianna (Division 1 UMass Lowell commit) long to prove my point. 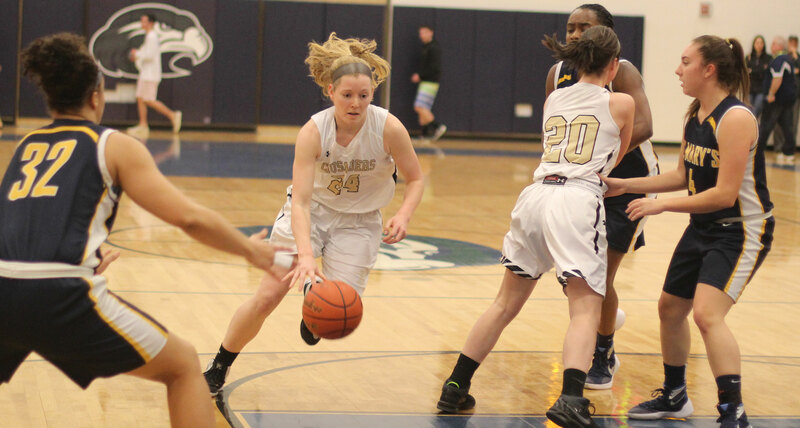 The Spartans broke away from the Hurricanes in the first three minutes with Brianna (26 points) tallying eight straight – three layups and a jump shot. 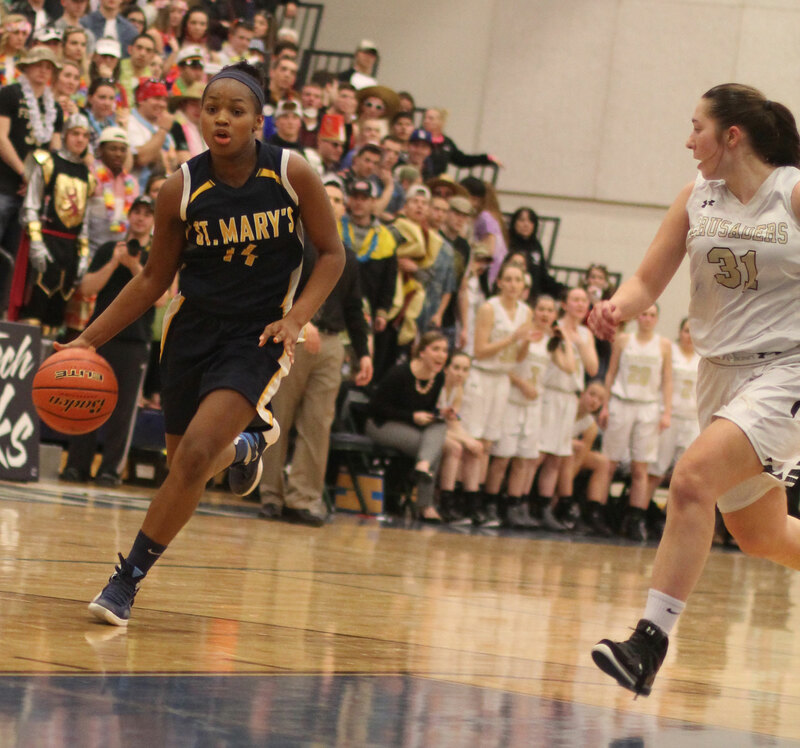 That run in the first period gave St. Mary’s (24-2) their initial separation and there was no looking back. The ‘Canes were able to stem the tide a couple of times but the lead kept growing. 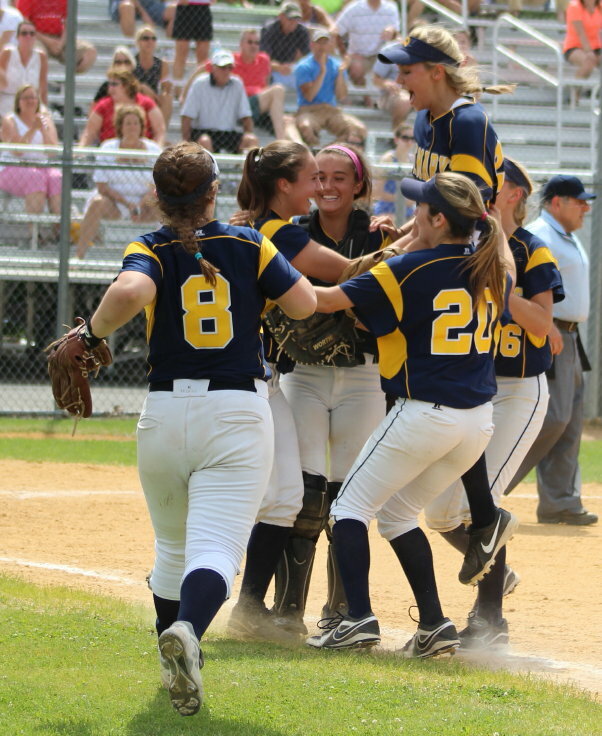 The Spartans, winners of nine straight, had point runs of: eight, ten, thirteen, eight, and nine. 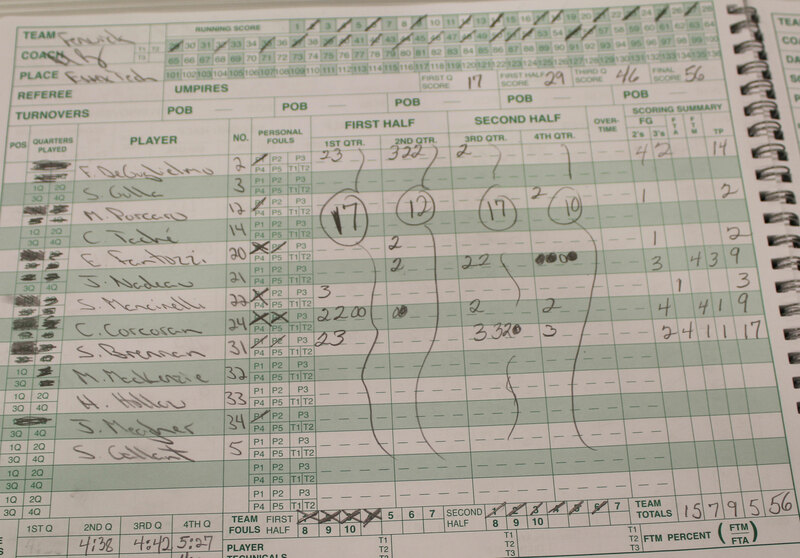 The only run that the Lady Canes from the Berkshire Country League put together was eight, late in the final quarter. Three’s by freshman Kailynne Frederick and Maddie Ryan keyed those consecutive points. Those were the only 3’s Hoosac Valley would get. 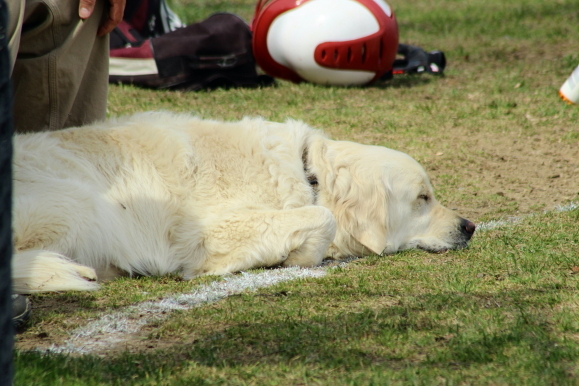 This game went from “still undecided” to “out-of-reach,” four minutes into the second half. 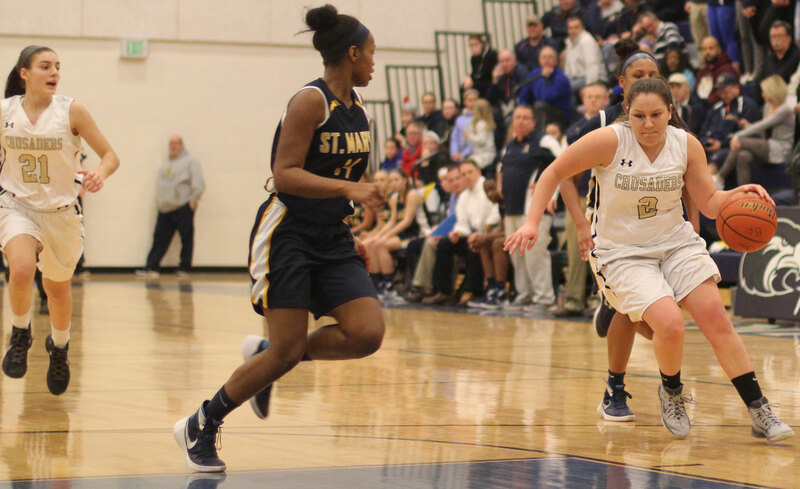 During a five minute stretch, starting with a minute left in the second quarter, St. Mary’s outscored the Lady Canes, 21-2, on their way to a 53-19 advantage with twelve minutes of playing time left. 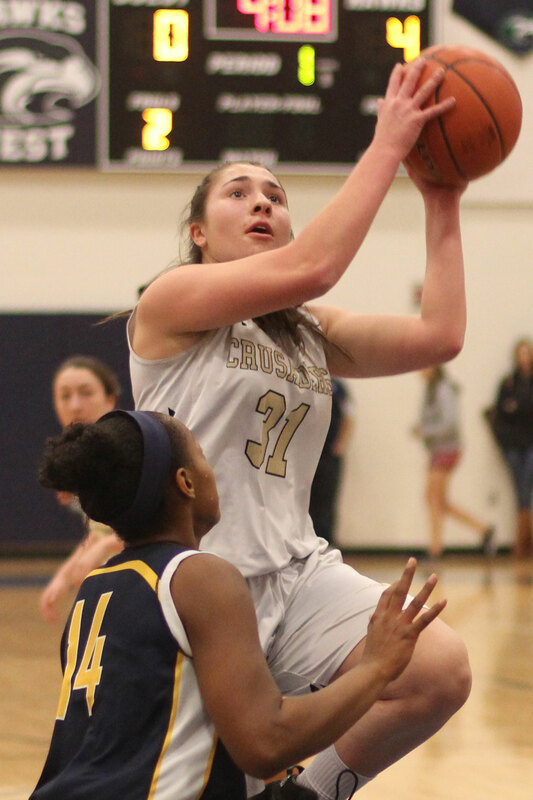 Jennie Mucciarone had a layup and three assists in the big run. 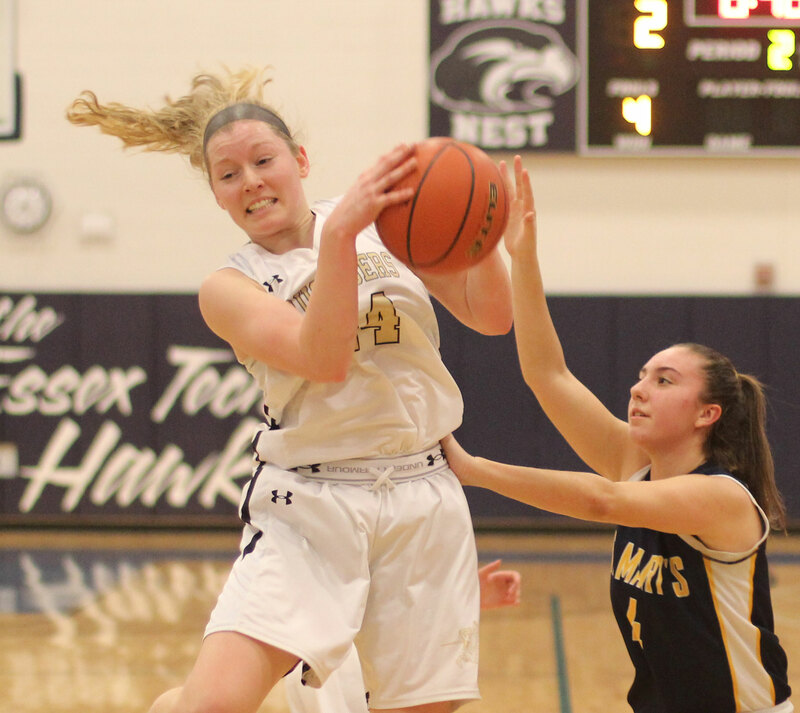 Reserve Gianna Moschella added an old-fashioned three and two layups. Softball has a mercy rule and I couldn’t help thinking that the need for those final twelve minutes to be played (with a team down 34) didn’t seem necessary. 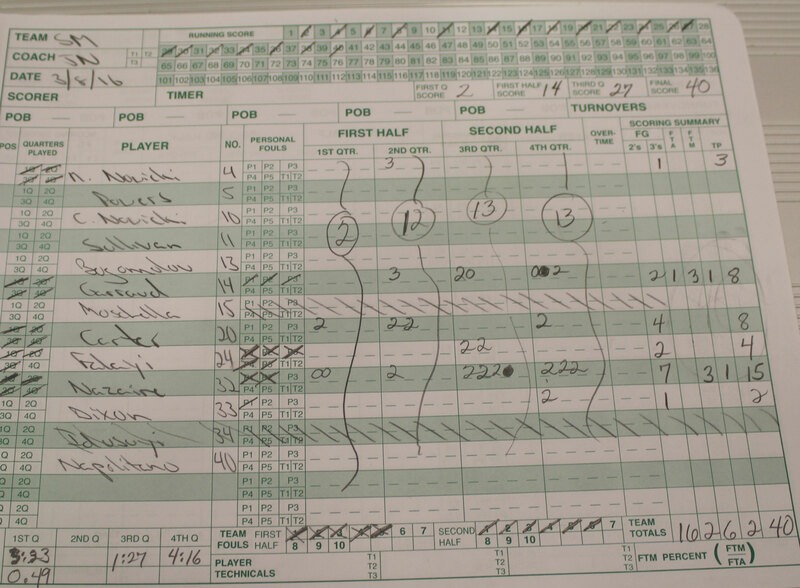 But it was played and St. Mary’s won, 74-36. 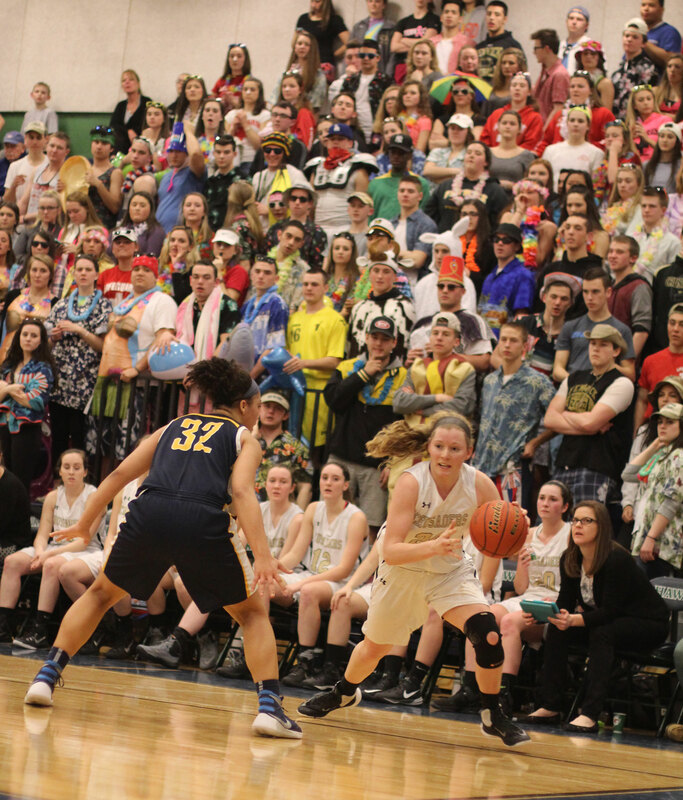 It was obvious early on that HV was not going to be able to force the Spartans into turnovers that would lead to quick baskets. 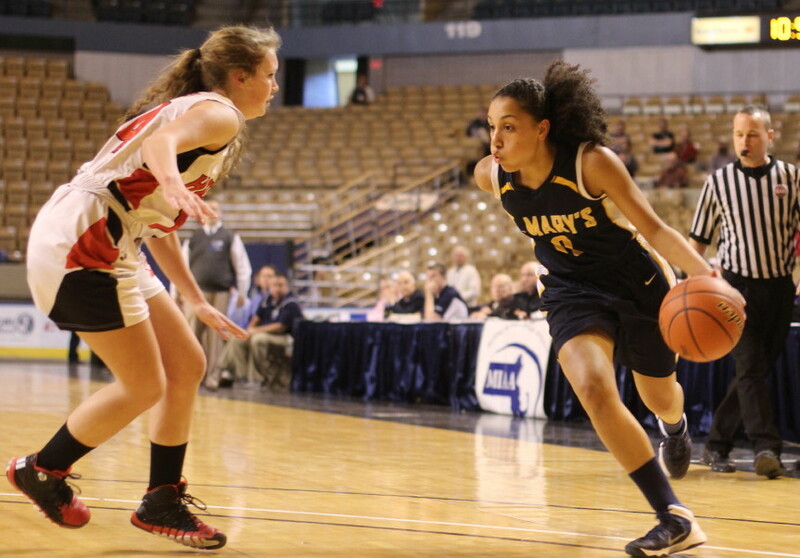 Too many good passers and dribblers on the St. Mary’s team. 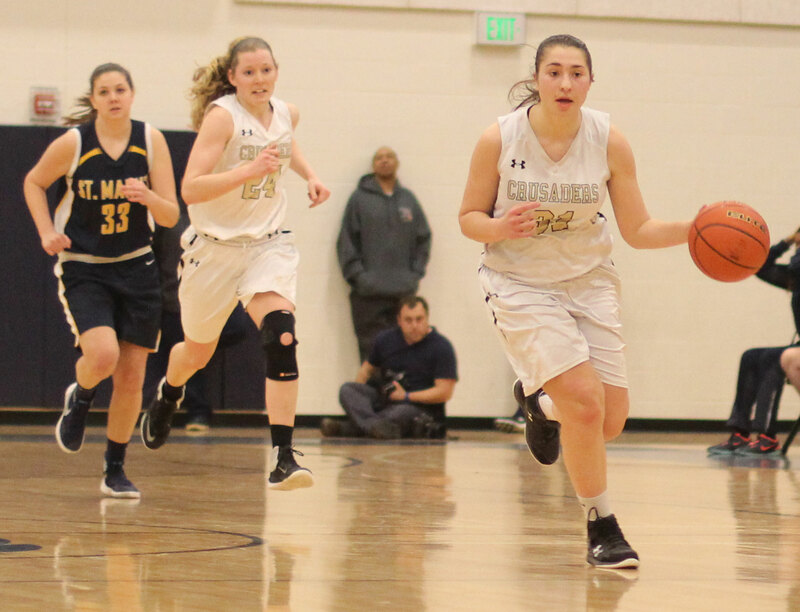 Unable to turn pressure into scores the Lady Canes fell back into a half-court defense that had no answers for the take-it-to-the-basket Spartans. 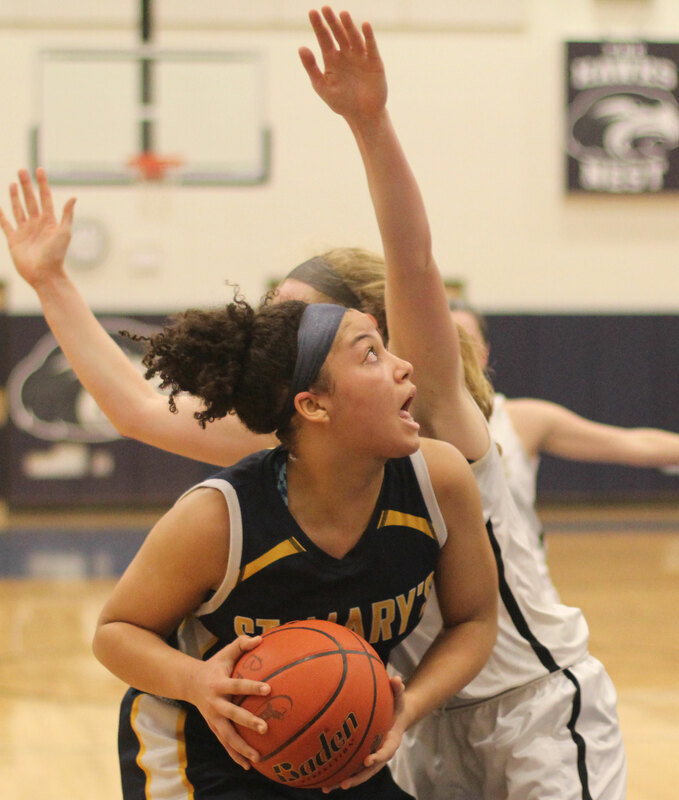 Senior Sharell Sanders ended up with thirteen points including eleven in the first half. The terrific point guard will be playing for Division 2 Caldwell College (New Jersey) next season. 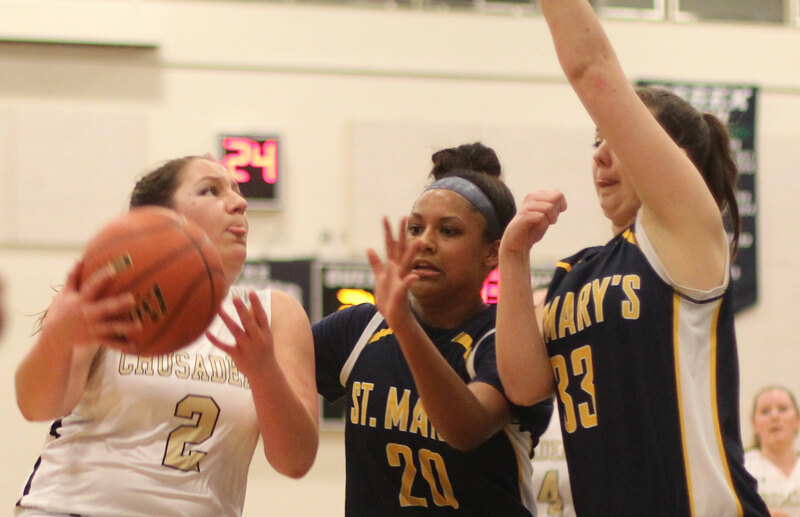 Another Spartans senior, Jennie Mucciarone sat out the second period with three fouls but was big in St. Mary’s pull away in the second half. 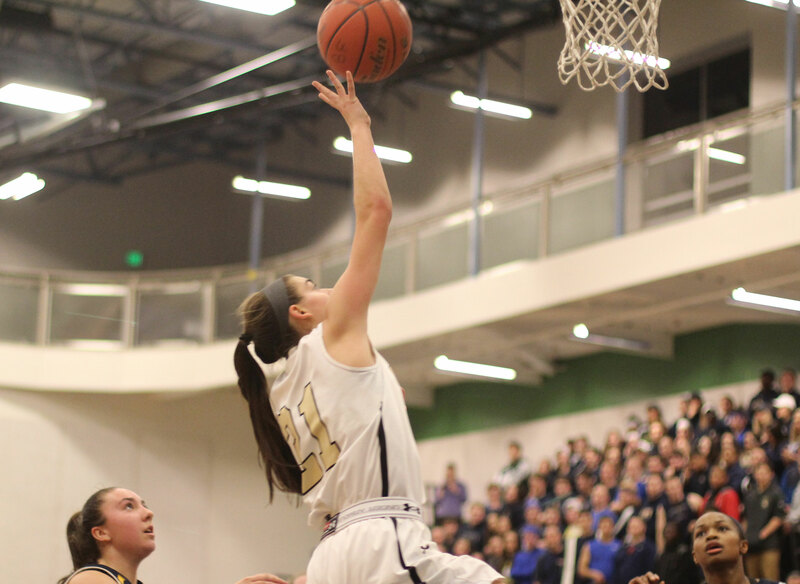 Jennie will play at Division 3 Tufts next season. 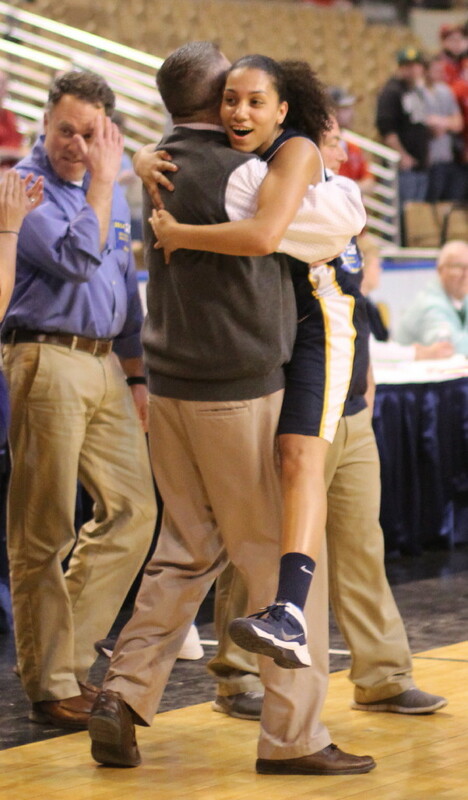 Brianna Rudolph (26 points) ended her Spartans career in wonderful fashion. 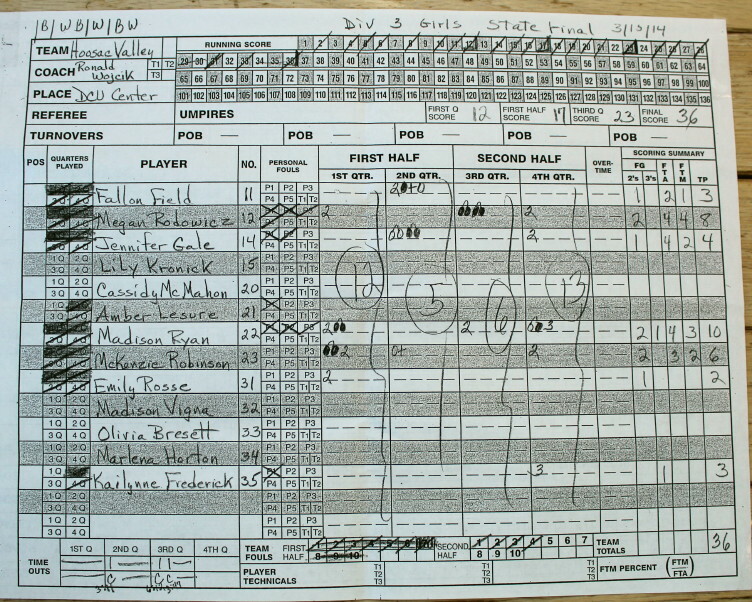 She was part of a man-to-man defense that had HV going east-to-west in the front court most of the game. Brianna will be at UMass Lowell in the fall. 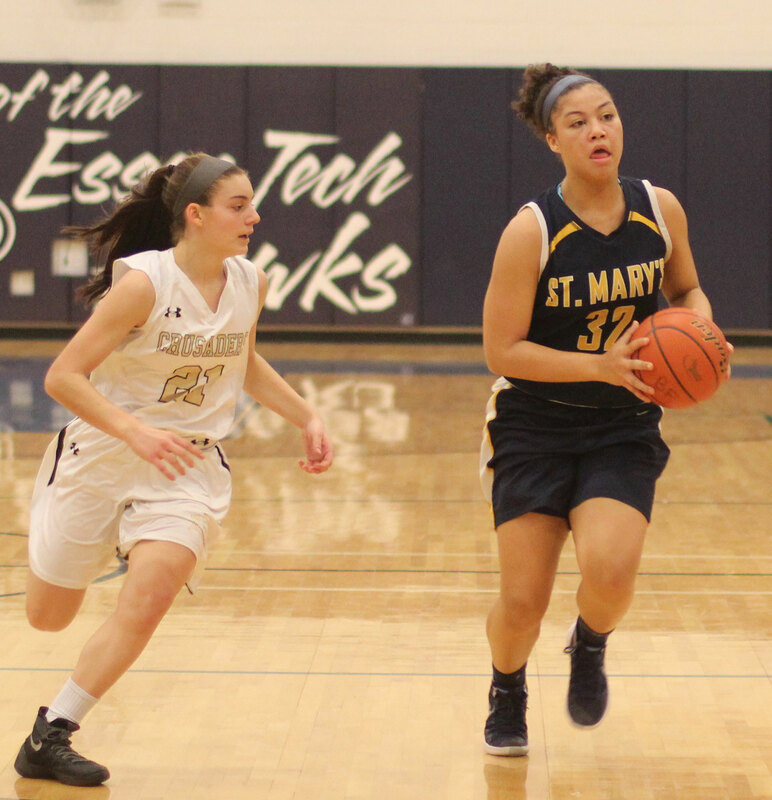 Sophomores Kayla Carter (10 points) and Gianna Moschella (14 points) would suggest that the well is far from dry at St. Mary’s. 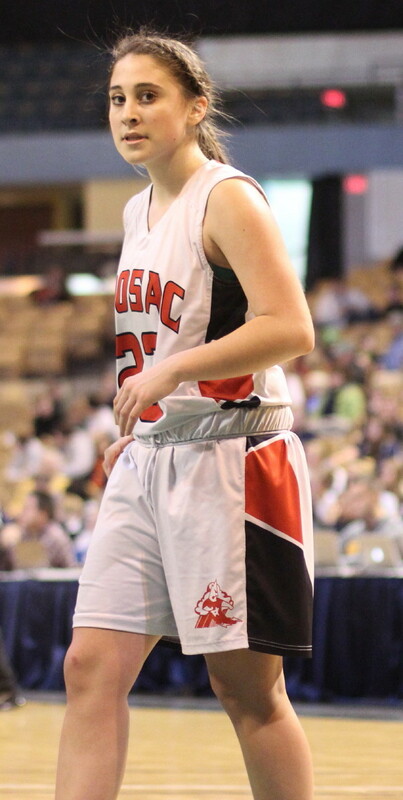 Maddie Ryan paced Hoosac Valley with ten points. There was never a lack of effort on HV’s part. 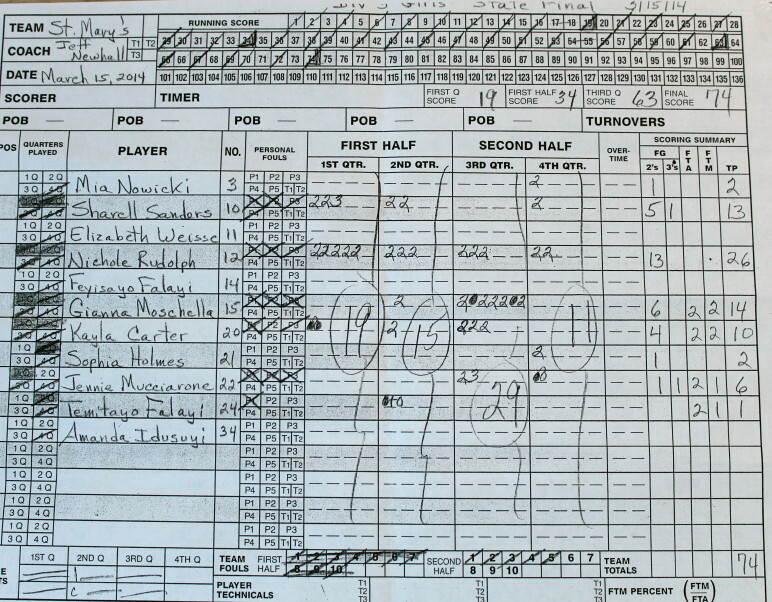 They finish 23-2.